Actually the DMIC project entails setting up seven green field smart cities between Delhi and Mumbai. The DMIC is a super ambitious $90 billion project initiated by the UPA government. The Indian government is working closely with Singapore to develop a virtual city or a “Little Singapore” along the corridor (DMIC). This issue was one of the top agendas of discussions External Affairs Minister Sushma Swaraj had with her Singaporean interlocutors during her official visit to that country last week. "Singapore's expertise in smart cities, urban planning and water management strategies offer a valuable learning experience for India. We shall work for setting up greenfield smart cities and for urban rejuvenation. Our experts shall identify the priorities and we shall coordinate its timely delivery," Sushma Swaraj remarked on 16 August after finishing her meetings with Singapore leaders. Singapore will be helping India in several areas, including developing transport infrastructure, creating heritage, tourism and educational hubs and setting up water treatment mechanisms, to name a few. Singapore has already popped up very high on the radar screens of India, especially in cooperation on the smart cities project. Already Singapore firms have won major contracts in the DMIC. Singapore has won the largest water desalination project contract in Dahej. Besides, two Singapore firms have won contracts in different places in Haryana relating to integrated management of water and also for their planning purposes. “Singapore has a very interesting use of water. Approximately 30 percent of their water is used from storage based on rainwater storage and recycling of waste water. This is a concept that would be extremely useful for us to see and try and emulate in some of our big urban cities,” MEA spokesperson Syed Akbaruddin said on 13 August while briefing on Swaraj’s Singapore visit. Singapore has transformed its water operation and two-thirds of Singapore’s land surface is now a water catchment area with water stored in 17 reservoirs, including the Marina Basin. Singapore collects waste water to produce drinking water. This meets 30 percent water needs of the City-State, a target that will be increased to 50 percent of future needs by 2060. India is eyeing Singapore’s expertise in this vital area which will come in handy for cities like Delhi, Mumbai and Kolkata. Besides, India is planning to utilize Singapore’s expertise for rejuvenation of existing cities. The Planning Commission has already identified cities for utilizing Singapore’s expertise in urban service delivery systems. The zone-wise break-up of the targeted cities is as follows: North (Delhi, Kanpur, Lucknow, Agra, Varanasi, Ludhiana); East (Kolkata, Patna, Ranchi, Bhubaneshwar); South (Chennai, Bangalore, Hyderabad, Vizag, Kochi); North East (Guwahati); Central (Indore, Bhopal); West (Greater Mumbai, Ahmedabad, Pune, Surat, Jaipur). By 2051, half of India’s population is projected to reside in urban settlements. The urban India’s contribution to the national GDP is expected to be 75 % to 80 % then. The number of million plus cities is likely to breach the 100-mark and the number of urban centers over ten thousand. This is why PM Modi’s focus on building 100 “smart cities” assumes relevance. It is a well thought futuristic project which throws up gargantuan challenges to urban administrators to make the cities really ‘smart’ and make them sustainable and efficient. Globally, cities constitute just two pe cent of the Earth’s surface – but they consume about 75 percent of the world’s resources. Thus cities and urban centres throw up a massive sustainability conundrum. NEW DELHI: The new government's focus on skills and smart cities is now part of the conversation between India and Singapore. Foreign minister Sushma Swaraj, on her first visit to Singapore agreed on five points of cooperation. These include scaling up investments, speeding up air and maritime connectivity and attracting Singapore investment and expertise in creating smart cities and urban rejuvenation, skills development and building independent ties with states. The joint statement reflected the prime minister's favourite catchphrases. "Singapore's expertise in smart cities, urban planning and water management strategies offer a valuable learning experience for India. We shall work for setting up greenfield smart cities and for urban rejuvenation. Our experts shall identify the priorities and we shall coordinate its timely delivery," Swaraj told official media. Swaraj said, "We look forward to Singapore companies speeding up connectivity and infrastructure projects in India, particularly, along the Delhi-Mumbai Industrial Corridor (DMIC), the Chennai-Bangalore Industrial Corridor and the North-East. Singapore could develop a virtual city or a 'little Singapore' somewhere along the corridor." Swaraj was in Singapore for a day to kick off the celebrations for the 50th anniversary of diplomatic relations between India and Singapore. Please do not ask us to rush in an unplanned manner. We are going about the project systematically. The timeline laid down by the Cabinet for development of the first phase of the seven new industrial cities is 2019. We are well on schedule. In fact, we are ahead of schedule in Gujarat and Maharashtra. These are new industrial cities of the size and scale of Singapore. They require extensive planning, detailed engineering of trunk infrastructure, environmental approvals, and land pooling procurement by the state government concerned. There is no legal framework for development of new cities in India. We had to finalise Share Holders’ Agreement and State Support Agreement and get the State Acts amended so that the city SPVs (special purpose vehicles) have the powers to levy external and internal development fee and user’s fee. All across the world, new cities have taken three decades to develop, grow and evolve. In India, we rush up with planning, engineering and execution all at the same time and make a mess of things. This is a unique opportunity for India to undertake sustainable urbanisation and use smart technology to leapfrog. We are confident of delivering on schedule in accordance with the timeline laid down by the government. The DMIC project is a partnership project between India and Japan, being driven at the level of prime ministers of the two countries. If Japan was not interested, why would JBIC (Japan Bank for International Cooperation) take 26 per cent equity in DMIC and the Japanese government create a $4.5-billion facility for DMIC project. In fact, based on the progress made in DMIC, the Japanese government has decided to partner India in the Chennai-Bangalore Industrial Corridor project as well. There are regulatory issues, but we have overcome them in most of the cases. There will be challenges, but we must address them and move ahead. This is not true. The finance minister, in his Budget speech has said resources would never be a constraint for the DMIC project. The government has approved an outlay of Rs 18,500 crore for creation of trunk infrastructure. Lands are being provided by the state governments. The Japanese government has approved $4.5 billion for non-commercial projects through Japan International Cooperation Agency (JICA) and commercial lending through JBIC. I also feel Japanese companies should not be risk-averse and must take more risks. State governments have used extremely innovative processes for land pooling and procurement. In Gujarat, almost 920 km is being taken through a process of town planning, with the participation of the local community. In Shendra, Maharashtra Industrial Development Corporation has taken land through an extensive process of negotiation, rehabilitation and resettlement. In Rajasthan and Haryana, resettlement and annuity have been used. Getting land will be through a process of negotiation and deliberations with the land owners, making them an integral component of the developmental process and skilling them for manufacturing, so that they can move to new jobs rather than live on disguised unemployment in agriculture. The states have put in a lot of hard work at the grassroot level (by) interacting with the local communities. The new Land Acquisition Act has laid down a vast number of processes for social impact including clearances by several committees. These will need to be eased to make the corridor projects move faster. There has been complete unanimity on the imperative need for the industrial corridors across political parties. The opposition-ruled states — Gujarat and Madhya Pradesh — have been extremely pro-active. I am sure the new government in Rajasthan will drive it vigorously. Uttar Pradesh was a slow starter, but it has now gained full momentum. Irrespective of the elections, the country requires manufacturing and creation of jobs for its young population. We need job enhancement and not job-protecting measures. India needs not merely the Delhi-Mumbai Industrial Corridor, but also the Chennai-Bangalore, the Bangalore-Mumbai and the Kolkata-Ludhiana corridors. This will, however, require a lot of political and administrative will as these are complex projects cutting across states. Any large programme of this nature has to be driven down into smaller projects. DMIC was broken down into seven cities. These cities were planned and then broken into non-commercial trunk infrastructure and commercial PPP (public-private partnership) projects. In the first phase, detailed engineering of trunk infrastructure is being carried out. You cannot create a new city without a backbone. You cannot bring in private parties without all clearances and approvals and without trunk infrastructure. It will become a complete real estate play. This is a long-term play. Mumbai: Amitabh Kant, chief executive officer and managing director of the Delhi Mumbai Industrial Corridor Development Corporation Ltd (DMICDC), believes he can implement the newly envisaged industrial cities on schedule. The Delhi Mumbai Industrial Corridor, or DMIC, plans to develop seven greenfield future cities in six states and integrate them with the Indian Railways’ dedicated freight corridor. How big is the DMIC project? Are there any parallels elsewhere in the world? DMIC is about developing greenfield future cities with backward integration to the dedicated freight corridor. At present, all goods produced in the northern part of India take 12-13 days to reach the ports on the western coast. The cost of transportation in India is, therefore, very high. By 2017, the 1,483km-long dedicated freight corridor will transport goods within 12-13 hours. There will, therefore, be a paradigm shift. Goods which are currently being transported by road would shift to container trains. The closest parallel is the Tokaido Corridor which represents accumulation of infrastructure and productive forces in the Tokyo-Nagoya-Osaka belt of Japan that accounts for 90 million people, almost 70% of the Japanese population. The cohesion of the corridor is linked through massive transport infrastructure including ports, airports, highways and the high-speed train network (or Shinkansen). In 1930, an express train took 8½ hours between Tokyo and Osaka. Now it takes only 2 hours and 20 minutes. The only other close parallel is the Asian Highway Network 1 (Gyeongbu Expressway) connecting Seoul to Busan. It is 416km long and has been the key driver of growth in the South Korean economy. We have just finished the financial structuring of Asia’s largest desalination project with a capacity of 336 million litres per day. This is being established by Hitachi Ltd of Japan and Hyflux Ltd of Singapore. Dahej SEZ Ltd had signed a water purchase agreement (WPA) to buy water. Then, there is the model solar project which will be integrated with a smart micro-grid. The project will ensure substitution of diesel through solar power. DMICDC has also structured a gas-generated power supply project with advanced Japanese technology based on imported LNG (liquefied natural gas). The project in Manesar is being established by Toshiba Corp. and the one in Neemrana by the Kansai Electric Power Co. DMICDC has also structured a logistics data bank which will share container movement information in real time. This will lead to competition, reduce transportation lead time and reduce logistic costs. How far have the industrial cities progressed? Any timelines? DMICDC is developing seven industrial cities in partnership with the six state governments. These comprise Dholera (903 sq. km) in Gujarat, Dighi Port City (253 sq. km) and Shendra (84 sq. km) in Maharashtra, Pithampur-Dhar-Mhow (372 sq. km) in Madhya Pradesh, Khushkera-Bhiwadi (160 sq. km) in Rajasthan, Manesar-Bamal (364 sq. km) in Haryana and Dadri-Noida (200 sq. km) in Uttar Pradesh. The detailed planning of all these cities has been fully completed. Plans of six cities have already been notified. Land pooling, acquisition, procurement are at advanced stages. The Union cabinet has fixed 2019 for the first phase of these cities. What challenges do you face? What could go wrong in this project? It takes 30-40 years for new cities to emerge. Despite pressure, we should not rush ahead with execution till planning and detailed engineering has been done to perfection. We must realize that creation of new cities is like making a New Mumbai or a New Chennai. In India, we have the tendency of undertaking planning and execution simultaneously without adequate detailing. We, therefore, make a mess as we did for infrastructure creation during the Commonwealth Games. I am a firm believer in a project being properly developed with all approvals in place and housed in a special purpose vehicle (SPV). This is a complex and difficult task but that is the real value DMICDC is adding to the project. There are several challenges. The project involves acquiring and pooling of adequate land by the state governments. How quickly they do it is a function of good governance and their ability to provide adequate resources. Since industrial cities are to be created for the first time in India, there is a need to have shareholders agreement and state support agreements with the states so that the cities are well institutionalized, have world class trunk infrastructure and a good governance mechanism. There is also the challenge of operation and maintenance of new infrastructure in new cities. Finally, long-term lending at reasonable rates is critical. Moreover, there is the severe challenge of water in areas of Haryana and Rajasthan which we are attempting to handle through integrated water resource management planning. Most critical, in all this, we must take the community along and make people participants in the development process. New industrial cities are feasible only if we are able to monetize the land values. This requires us to fully ring-fence the city SPV and capture the upsides. India has been a reluctant urbanizer but we can leapfrog by using smart technology. Therefore, we have introduced layers of information, communication, technology (ICT) on top of the geographical master plan. Cisco Systems Inc. and IBM Corp. have worked with us in this unique exercise. What are the expected benefits of the project? The key challenge for India is to grow at the rate of 9-10% per annum on a sustained basis for the next three decades to be able to create jobs for a very young population. For this, the manufacturing sector must grow at the rate of 15-16% per annum. The share of manufacturing in India’s GDP (gross domestic product) is a mere 15% as compared to 40% in Thailand and 34% in China. Manufacturing will be the key economic driver of the industrial cities. It will lure workers and young managers to move into these new cities. We envisage doubling the employment potential in seven years, tripling industrial output in nine years, and quadrupling exports from the region in eight-nine years. What challenges did DMICDC face in land acquisition? India is too vast and big a country to have a single strategy for land acquisition. In the case of Dholera, the government of Gujarat has adopted a town planning process with community participation. This has been extremely successful and we have been able to pool almost 540 sq. km of land through six different town planning schemes. This is unparalleled. In the case of Maharashtra, the MIDC (Maharashtra Industrial Development Corporation) has undertaken negotiated purchase with land owners under the MIDC Act. In Haryana, there is the process of annuity and in Rajasthan, there is resettlement and rehabilitation. What is Japanese government’s role in the project? After the Second World War, the government of Japan grew on the back of manufacturing. It, however, polluted itself heavily. Subsequently, METI (ministry of economy, trade and industry) took this up as a challenge and adopted sustainable practices. Today, everything is recycled in the Japanese city of Kitakyushu and in Yokohama city, wastage was reduced by almost 38%. There is a need to learn from Japan and adopt practices so that we grow as a manufacturing nation in a sustainable manner. Land for the industrial city is being brought by the state governments as their equity, and the government of India is pumping resources for the creation of trunk infrastructure. In addition to the revolving fund of Rs.18,500 crore from the government of India, the government of Japan has provided $4.5 billion through JICA (Japan International Cooperation Agency) and JBIC (Japan Bank for International Cooperation). Any role models when it comes to speedy and timely implementation? My role model is the high-speed bullet train, the Shinkansen, which has not run late even for a minute since its inception in 1964. Shinkansen is the world’s busiest high-speed rail line carrying over 200 million passengers a year. This is simply because the Japanese people believe in perfection, both in planning and execution. In India, the Delhi Metro under E. Sreedharan has been a great example of good execution in both planning and execution. देश की आर्थिक शक्ल पूरी तरह से बदल देगा यह प्रोजेक्ट! The much-delayed Delhi Mumbai industrial corridor (DMIC) may finally gain momentum with the finance ministry approving the purchase of a majority stake in DMIC’s apex body by government-owned financial institutions. Life Insurance Corp. of India (LIC) and India Infrastructure Finance Co. Ltd (IIFCL) will buy stakes in the Delhi Mumbai Industrial Corridor Development Corp. (DMICDC) from Infrastructure Leasing and Financial Services Ltd (IL&FS) and Infrastructure Development Finance Co. (IDFC). A finance ministry and an industry department official confirmed the development. DMICDC was incorporated in January 2008 with an authorized equity base of Rs.10 crore. The government held a 49% stake in the special purpose vehicle (SPV), IL&FS 41% and IDFC the balance 10%. DMIC proposes to develop what it calls self-sustainable smart cities on either side of the 1,483km-long western dedicated rail freight corridor between Dadri in Uttar Pradesh and Jawaharlal Nehru Port Trust in Navi Mumbai. DMIC will run across six states—Uttar Pradesh, Haryana, Madhya Pradesh, Rajasthan, Gujarat and Maharashtra—and a majority of the projects in the corridor are envisaged to be implemented through public-private partnerships. It is touted to be the largest infrastructure project in the world, with an estimated $90-100 billion required only to set up the infrastructure over the next 30 years. The department of industrial policy and promotion (DIPP) official, also speaking on condition of anonymity, said the department has written to all the stakeholders to take the process forward. The new structure, which received cabinet approval on 15 September, has been designed as a model for urbanization and manufacturing with the least contribution from the government, the DIPP official said. “In the earlier structure, the upsides arising out of bidding of projects and monetization of land value in future would have gone to the private companies even though the government of India is funding project development in the DMIC region. This will no longer be the case,” the official said. In the new structure, the DMIC apex authority will be chaired by finance minister Pranab Mukherjee and the state-level authorities by the respective chief ministers. A DMIC fund will be set up as a trust. It will be chaired by the secretary of the department of economic affairs in the finance ministry and will comprise the DIPP secretary and financial adviser and representatives of the department of expenditure, Planning Commission and the chief executive of of DMICDC, who will also be the chief executive officer of the trust. The fund will contribute debt and equity to the SPVs on a case-to-case basis, after investment proposals submitted by DMICDC are approved by the board of trustees. The government grant will be revolving in nature to enable the development of more cities. The cabinet, in the 15 September meeting, also approved Rs.17,500 crore over five years for providing assistance through debt or equity to the SPVs and for the development of trunk infrastructure in the industrial cities along the DMIC. The cabinet also approved a financial assistance of Rs.1,000 crore over five years for further project development activities. Ajay Dua, former secretary of DIPP, said the buying out of the majority stake in DMICDC is a welcome step. “Due to the presence of private players in the DMICDC, operational problems were coming up. State governments had issues and did not have enough faith on DMICDC as it was a private venture,” he said. It will also be easier now to get funds from the Japan Bank for International Cooperation (JBIC) as it does not lend to private companies, Dua said. During the visit of Japanese Prime Minister Yoshihiko Noda to India in the last week of December, the Japanese side announced a $4.5 billion contribution for projects with Japanese participation, through financing from JBIC and official development assistance from Japan International Cooperation Agency to the DMIC facility. The DIPP official said the Japanese side has also made a request for a 26% equity participation in DMICDC by the government of Japan. A number of DMIC projects are ready for implementation and “discussions for formation of city-level SPVs in Gujarat and Maharashtra with the respective state governments have already been initiated”, he added. Currently, Mumbai Rajdhanis run at an average speed of 100 km per hour and take about 15 hours to reach the destination. "Our aim is to reduce the travel time by almost half between Delhi-Mumbai and for this we have to procure train sets to run at higher speed on the existing track," the official said. Train sets are like EMU trains consisting of self-propelled electric locomotive and 10 to 12 modern coaches. "Since our existing locomotives are not designed to run on 200 km speed we have to go for the train set in the Golden Rail Corridor," he said, adding "We have to strengthen the track, bridges and modernise the signalling system before increasing the speed to 200 km per hour." There will be a new fare structure for the high-speed train for the Golden Rail Corridor. Asked how the existing track will take the load of new trains, he said, "All the freight trains will be shifted from Mumbai-Delhi route after the commissioning of the Western Dedicated Freight Corridor. So, we will utilise the additional capacity of the existing track for the train sets." The Western DFC is likley to be commissioned by 2016-17. NEW DELHI: The Prime Minister's Office (PMO) has stepped in to accelerate UPA's pet project – the Dedicated Frieght Corridor. The PMO called chief secretaries of Maharashtra and Uttar Pradesh for a meeting on Friday and instructed them to speed up land acquisition for the ambitious project that will significantly reduce travel time and ensure that the railways runs one of the world's largest freight operations based on international technologies. Dedicated Freight Corridor Corporation (DFCC) has already acquired 50% of the 10,840 hectares required for the project but the PMO is keen to prevent further delays. Sources said the state officials were instructed to remove hassles in acquisition of the remaining land. DFCC aims to complete land acquisition by June 2012 which is crucial for timely completion of the project. DFCC has set a new deadline of December 2016 for completion of the eastern corridor – Ludhiana to Dankuni. The western corridor – Dadri to Jawaharlal Nehru Port – is expected to be ready by March 2017. Land for the mega project requires acquisition in six states, 52 districts and 2,500 villages, affecting around one lakh people, according to DFCC sources. "State government's help is crucial for land acquisition at such a massive scale," an official said, adding that push from the top will fasten the process. Railway Board chairman and senior officials from finance and environment ministries were also called for the review meeting. Sources said PMO wants everyone to cooperate to speed up the project. "It was also decided to restore the autonomy of the corporation that was taken away after reported corruption cases to speed up the PM's pet project," an official said. Touted as the biggest infrastructure project, its cost is estimated to be a Rs 77,000 crore. The exclusive corridors will ensure a quantum leap in increasing railways' transportation capacity by building high-speed and high-capacity dedicated freight corridors. The project will create segregated infrastructure for freight movement that will help railways to concentrate on both freight and passenger business. The corporation is also planning to develop economic zones along the corridors on the lines of Delhi-Mumbai industrial corridor, along with setting up of logistic parks that will lead to generation of largescale economic activity. Construction work is in progress in 66 kilometres of Sonnagar-Mughalsarai portion of the corridor. The work on the Mughalsarai-Ludhiana portion (1183 kms) of the corridor is being funded through World Bank loan. The loan agreement for the Phase-I (Khurja-Kanpur, 343 kms. Section) has been signed with the World Bank and process for finalization of tender for civil works of this section has commenced. Work on 54 major and important bridges between Vaitarna and Surat is in progress. Loan Agreement with Japan International cooperation Agency which is funding the entire Western Freight Corridor work, has been signed for Phase-I of the work between Rewari and Vadodara. Tendering process for execution of civil work on the 625 kms Rewari-Iqbalgarh portion has also commenced. Expenditure till March 31st 2011 on Eastern and Western DFC Project is INR 2026.41 crore. Budget allotment for 2011-12 is INR 2956 crore and expenditure till September 2011 is INR 315.8 crore. Mumbai: The master plans of new industrial cities in the Delhi-Mumbai Industrial Corridor (DMIC) have been approved and except for Uttar Pradesh, the state governments in this corridor have initiated the process of land-acquisition. This information was given by Jyotiraditya Scindia, minister of state for commerce and industry, in a written reply to a question in the Rajya Sabha (Upper House of Parliament) yesterday on the current status of the DMIC. He informed the House that the Union Cabinet in its September 15 meeting had, inter alia, approved financial assistance of Rs 175 billion (Dh3.51 billion) over the next five years for the development of industrial cities in this corridor. In addition, Rs10 billion has been approved for undertaking development activities by the Delhi-Mumbai Industrial Corridor Development Corporation. The 1,483-km project running through six states — Delhi, Uttar Pradesh, Haryana, Rajasthan, Gujarat and Maharashtra — will come up along the proposed Delhi-Mumbai dedicated rail freight corridor. The fund infusion is for creating seven new cities in the industrial corridor. Each city would be a greenfield or a brownfield area with a combination of production units, public utilities, logistics, environmental protection facilities, residential areas, social infrastructure and administrative services. With better connectivity being built through this corridor from hinterland to the western ports of Mumbai and Jawaharlal Nehru ports in Maharashtra and Kandla in Gujarat, along with several minor ports, greater industrial investment is expected. After objecting to allowing foreign direct investment in retail trade, it has emerged that the Mayawati government has 'opposed' yet another major UPA Government initiative – the $90-billion Delhi-Mumbai Industrial Corridor (DMIC) in its present format. DMIC is to come up over 1,483 km spanning six States (Uttar Pradesh, Haryana, Gujarat, Madhya Pradesh, Rajasthan and Maharashtra) and with end-terminals at Dadri in the National Capital Region of Delhi (NCR) and Jawaharlal Nehru Port near Mumbai. The bone of contention between the Centre and Uttar Pradesh is the setting up of a Special Purpose Vehicle (SPV), official sources told Business Line. The Centre had envisaged each DMIC Industrial City to be implemented by an SPV — a joint venture between the Centre and the concerned State. The SPV, with powers for planning and development of the project, was intended to ‘ring-fence’ the project from risks including corruption. The Mayawati Government objected to the SPV saying it wanted to examine the Dadri-Noida-Ghaziabad Investment Region (to come up over 300 sq km as a cargo and logistics hub) under the purview of the UP Industrial Area Development Act. Though a committee was formed (led by the Chairman of Noida/Greater Noida/Yamuna Expressway Authority) to examine the Centre’s proposals, the UP Government “didn’t take it forward,” the sources added. Any monetisation of land value would have been captured by the SPV, which the state was not comfortable with, these sources claimed. With “no progress” since early this year, the Department of Industrial Policy and Promotion Secretary Mr P K Chaudhery on November 25 wrote to the UP Chief Secretary Mr Anoop Mishra that the project could not move forward despite the Centre’s best efforts because the State did not take a decision on the delineation of the site for the investment region. Asking the state to decide on the delineation of the land soon, Mr Chaudhery wrote that the Centre’s funds will be released to the state only after the DMIC Development Corporation (DMICDC) consultants prepare the Master Plan and subsequent approval of land procurement by the state. The DMICDC had signed MoUs with all the six DMIC States for the joint development of the project. Though the MoU specifies the formation of SPV, the Centre is not planning any legal action against Mayawati Government for not sticking to what they singed because land is a state subject. “If they don’t grab this opportunity, it will be a loss to the state,” an official said. The DMIC is to be established on either side of the Western Dedicated Freight Corridor (DFC). The consolation for the Centre is that UP and NCR form just 1.5 per cent of the DFC’s total length. Rajasthan (39 per cent) and Gujarat (38 per cent) account for 77 per cent of the total length, followed by Haryana and Maharashtra (with 10 per cent each). The DMIC project — which is expected to attract huge foreign investments and set up world class infrastructure — seeks to double the employment potential, triple the industrial output and quadruple exports from the region, in the first five years after it is constructed, the Industry Ministry says. The DMIC forms an integral part of the National Manufacturing Policy approved by the Union Cabinet in October. The policy aims to create 100 million jobs within a decade and increase the share of manufacturing in the country’s GDP to 25 per cent by 2022 from the current 15-16 per cent. Among the key instruments for realising these goals is the setting up of National Investment and Manufacturing Zones (NIMZ) that is to come up over an area of over 5,000 hectares. The first phase of the NIMZwill be established along the DMIC. NEW DELHI: Putting the country's biggest infrastructure project into high gear, Dedicated Freight Corridor Corporation has invited pre-qualification bid of Rs 8,000 crore for works between Rewari (Haryana) and Ikbalgarh (Gujarat) of the western corridor that will run from Delhi to Mumbai. The 625-km stretch of western corridor is part of the Rs 70,000 crore project which aims to build new rail tracks for seamless running of freight trains at speeds of 100 km per hour. The exclusive freight corridor will significantly reduce travel time and allow railways to run one of the world's largest freight operations based on international technology. DFCC has re-tendered after three consortiums that were selected failed to meet the norms which had a clause of mandatory requirement of a Japanese company as the lead partner. The selected Japanese firm will have at least 51% stake and will be responsible for execution of the contract. The 1,534-km western corridor is being fully funded by the Japan International Cooperation Agency (JICA). The DFCC has also completed its land acquisition in Maharashtra, resolving contentious issues that had come up in Thane district. The corporation also completed one of the 54 major bridges near Sanjan in Gujarat falling between Surat and Mumbai. Upbeat with the speeding up of work on the corridor, railways has set up a new deadline to make UPA's ambitious infrastructure project operational. The eastern corridor – Ludhiana to Dankuni – will be completed by December 2016 while phase 1 of western corridor – Rewari to Vadodra – will be over by December 2016 with the entire corridor (Dadri to Jawaharlal Nehru Port) expected to be ready by March 2017. The first deadline set for the project was 2015 which was later extended to 2020. Considering the criticality of the project, Prime Minister's Office (PMO) is keeping a close watch on the progress. Sources said PMO will review the progress next week. Global manufacturing and trade corridor plan has the potential to create as many as 3 million jobs. India has embarked on creating the Delhi-Mumbai Industrial Corridor (DMIC) in collaboration with Japan. The US$100-billion project is expected to double employment potential, triple industrial output and quadruple exports from the region in five years. Total employment to be generated by the project is estimated at 3 million people, mostly in the manufacturing and processing sectors. Plans call for a 4,000-megawatt power plant, three seaports and six airports, in addition to connectivity with existing ports. Construction is scheduled to be complete by 2018, and the corridor will house and employ more than 1.5 million. "The concept of the DMIC is that economic growth in India has to remain at least 9% each year," said DMIC president Amitabh Kant. "It can be achieved if the industrial sector continues to grow rapidly." The service industry, he says, simply does not create enough jobs. The DMIC concept coincides with the National Manufacturing Policy, which aims to increase the sector's share of the country's GDP to more than 25% by 2022 from the current 16% and create 100 million jobs in the next 10 years. The project is aimed at developing an industrial zone spanning six Indian states. It received a major boost after India and Japan inked an agreement to set up a project development fund. The initial size of the fund will be $223 million, with both the Japanese and Indian governments contributing equally. The corridor will include six major investment regions of 200 square kilometres each and will run through the states of Delhi, Uttar Pradesh, Haryana, Rajasthan, Gujarat and Maharashtra _ spreading across 2,700 km with an additional 5,000 km of feeder lines connecting Mumbai to West Bengal. A dedicated rail freight corridor will reduce the Delhi-Mumbai transit time from 60 to 36 hours. Ecologically sound new cities will use sustainable energy, contrasting with other Indian cities and their images of dirty streets, open sewers, slums and pollution. But the new cities are still in the early planning stages. It will take some time before actual construction work can begin. Critics say there are many hurdles to overcome, mainly related to acquiring agricultural land for industrial and housing purposes. Large developments like these in India are often marred by large-scale corruption or a simple lack of quality. Mr Kant says good planning may prevent this. "Planning and construction never go hand in hand here in India," he said. "This time we've got the best planners in the world in one place who will make sure that the master plans are ready by the time construction begins. There is no haste. And we won't start building until the very last building permit has been issued." On a map in the office of the National Highways Authority of India, a red line runs from Delhi to Mumbai, marking out a new six-lane project. The 1,375-km span is one of the four arms of the Golden Quadrilateral _ begun during the Atal Bihari Vajpayee government in 1998 _ connecting four major cities in the country. This is the platinum stretch of the Golden Quadrilateral. The NHAI took bids last month for expanding the 550-km Kishengarh-Udaipur-Ahmedabad leg to six lanes. Ten companies responded, with each bidder willing to pay a premium of more than 3 billion rupees for the next 26 years. Experts and data suggest that projects in India's north-to-west corridor promise the highest toll revenue. Generally a company endures losses for the first five years and breaks even after that. On the Delhi-Mumbai routes, however, companies are expected to break even by the third year. Transport officials say Delhi-Mumbai will continue to lead toll revenue collections for at least another decade. Traffic growth on the Delhi-Mumbai route is growing at 8% a year, versus 6.5% for the rest of the highway network. According to a recent McKinsey report, the Delhi-Mumbai sector tops a list of 10 routes with the country's densest freight traffic. Thane-Chennai, Delhi-Kolkata and Delhi-Amritsar also figured on McKinsey's list. The Golden Quadrilateral accounts for over 60% of goods transported in India, and the Delhi-Mumbai route accounts for 40% of these goods. Furthermore, the volume of air cargo in the country will be 2.64 million tonnes this year (with Delhi accounting for 600,000 tonnes and Mumbai accounting for 500,000 tonnes). Truckers operating in the region say its prospects are higher relative to the south or the east of India. "The northwest is being developed as a logistical hub, as it is expected that a bulk of goods movement will be in this region," said Mukesh Dave, a senior executive with the All India Motor Transport Congress. "Every manufacturer in the country is now stepping up to develop and expand warehouses along this zone _ mainly in Gujarat, Rajasthan and Delhi." A network of mass transport systems is imperative to avert urban vehicular traffic, as the number of cities with more than one million people will increase from 48 to 68 in the next two decades. India has seven cities at present with a population of at least 4 million. By 2030, Mumbai is likely to have 33 million people, followed by Delhi with 26 million, Kolkata (23 million), Chennai (11 million), Bangalore and Pune (10 million each), Hyderabad (9.8 million), Ahmedabad (8.4 million), Surat (7.4 million), Jaipur (5.4 million), Nagpur (5.2 million) and Kanpur and Vadodra (4.2 million each). Town planners say cities will account for 69% of the country's GDP in the next two decades. Total urban population is already 377 million and may exceed an earlier projection of 590 million by 2030. The critical issue in times to come will be efficient transport to ease burgeoning urban vehicular traffic. The challenge for urban planners: seven mega-cities with 20% of India's population will demand 40% of the $1.2 trillion projected for infrastructure investment. (Reuters) – Chotubhai Raghani's fields in a dry, salty strip of Indian coastline on the Arabian Sea never yielded much wheat but he feels like a lucky man now he's started selling them at a juicy markup. He expects his land may one day make way for a car factory or an air-conditioned shopping mall, all part of what may be India's most ambitious infrastructure project ever. Excitement is rising almost as quickly as land prices in his village, one of the sites chosen for building 24 industrial cities from scratch along a 1,483 km (920 mile) railway line. The government plans to build a corridor bigger in land size than Japan, stretching from New Delhi down to the financial hub Mumbai in the west, that could help transform India's economic landscape and give its choked, teeming cities room to breathe. "It's going to change our lives," said Raghani. "We've tilled this land for generations but we only get a small mouthful out of it." Skeptics call the $90 billion project, known as the Delhi Mumbai Industrial Corridor (DMIC), over-ambitious. India, bogged down by corruption, staggering bureaucracy and land battles, has a long history of failed infrastructure plans. "It's a very crucial project for supporting GDP growth," said Pratyush Kumar, President & CEO of GE Transportation in India, a company with interests from railway engines to wind turbines. So far it is not involved in the DMIC project. "Nobody is saying that it's not moving, but the glacial pace will choke the GDP ambitions," he said. "The pace has to pick up and they need to get away from this whole decision-making paralysis of 'hey, we can't award large projects because of all the scams'." If the DMIC fails, Prime Minister Manmohan Singh's government will have lost a golden opportunity to sell India to investors and will feed the perception that, unlike China, it lacks the will to act when it counts. If it succeeds, the project could be the jolt Indian industry needs to sustain the country's heady economic rise. The timing couldn't be better amid global financial strife, rising interest rates and domestic policy stagnation caused by government corruption cases that have dampened confidence. New Delhi has earmarked an initial fund of $4.5 billion to build the core infrastructure of each city, such as roads, power supplies and sewage treatment plants, and expects a similar contribution from the project's partner, Japan. Once the basics are there, the thinking goes, investors will be convinced of the DMIC's value and will build factories, housing and more in a public-private partnership. The government can then sell them the land it has acquired from farmers, using the funds to start building the next city. Despite years of economic boom, India's infrastructure is rickety and its manufacturing sector sluggish. Transporting goods is expensive and slow — it can take more than two weeks to move a container from Delhi to Mumbai. It is hoped the new freight line will slash that to under 24 hours. "If India does not create new cities, many of its existing cities will be slums," said Amitabh Kant, the civil servant in charge of the project. The idea for an industrial corridor took shape in 2006 as a deal hatched by the governments of India and Japan, inspired by a similar project around Tokyo that helped Japan's economic rise after World War Two. Work on the first hub, Dholera, is to start shortly, with Indian firms Mahindra Lifespace Developers Ltd and Hindustan Construction Co Ltd already on board. Plans envisage Dholera being transformed from a cluster of small villages and hamlets, where cows laze to the sound of women pounding clothes in the village pond, into a city of 2 million people by 2040 with its own international airport. If all goes to plan, Dholera will become a magnet for engineering, electronics and pharmaceutical firms, helping meet the corridor's target of doubling employment and tripling industrial output across the six states through which it runs. "I am eagerly awaiting the day that a plane lands in our village," jokes one skeptical farmer as others around him laugh. Although building even a single highway can be achingly slow in India, a crowded democracy of 1.2 billion, the DMIC project may have enough going for it to prove doubters wrong. One big plus is Kant himself, a widely respected official who is no stranger to selling India's image abroad. He was the architect of a flagship 'Incredible India' tourism campaign that sought to dispel stereotypes of snake charmers and touts. Authorities in the DMIC are also trying hard to minimize risks to potential investors while ensuring that the farmers get a good deal, obtaining clearances and negotiating land sales. This is somewhat unusual for India, where a major deterrent for businesses is that they must first bid to build projects before wading in to acquire land or permissions from umpteen ministries, with all the hassles and delays that entails. The DMIC is being kicked off by Gujarat state, a favorite of investors who like its lack of red tape, easy land sales and ambition to become a global industry powerhouse like China's Guangdong. Raghani, and many others like him, were happy to sell their land — a marked contrast to the deadly clashes over land that have happened elsewhere in India. However, the challenges Kant faces are enormous, not least tackling the bureaucracy inside his own government. Getting permission to build even one power plant needs 44 clearances. "Look at the number of sanctions and approvals. This page, this page," he exclaimed during an interview in his office, thumbing through pages of stapled documents. Corruption, one of the biggest hindrances to business in India, is another. Land acquisition has not even started in Uttar Pradesh, a state of 200 million people with a reputation for kickbacks. "Unless you bribe, they will not give up the land," said a government source involved in the project. Graft scandals have haunted Singh's government since last year, with a clutch of high-profile politicians sent to trial amid mass street protests. The DMICDC, the company created to steer the project, is changing its business model from being majority-owned by two private lenders to being under government control. It wants to ensure private firms are not seen as being cozy with the state, the government source said, speaking on condition of anonymity. "It's public money being put in, so immediately people will start saying the DMICDC is nothing but a front for siphoning money," the source said. Progress on the rail line, which is headed by a separate state-run company, is also slow. India has a mixed record on project implementation. Stories of bribery, construction delays and filthy athletes' rooms made Delhi's hosting of the 2010 Commonwealth Games a PR disaster. But swanky new airports in Delhi and Mumbai, a high-speed metro in the capital and some slick new highways show that the government's huge infrastructure push, with a planned splurge of $1 trillion over the next five years, is paying some dividends. The ambitious Delhi-Mumbai Industrial Corridor (DMIC) would be totally green, Union Minister for New and Renewable Energy Farooq Abdullah announced at an “International Conference and Exhibition on Green Buildings” here on Thursday. The government was taking a number of steps to use new energy as a major source of power. The major challenge before it was to produce more power and bring down the cost of the new energy. Dr. Abdullah said the Ministry was planning to replace diesel power generators of all mobile phone towers with solar panels. The country should make a gradual switchover to renewable energy, as coal and diesel prices were rising and becoming unaffordable. Dr. Abdullah released the new rating system for green buildings, known as “Leed 2011 for India,” and distributed awards to students from across the country for taking part in green competitions. The new rating comes into effect immediately. It marks a milestone in the green building movement in the country seeking to ensure energy efficiency and sustainable buildings. Industry is already finding it difficult to get land. How will you ensure finding 5,000 hectares of land for an NIMZ? First of all, it is in partnership with the states. Land banks will be created by the states; zoning of the land will be done by the states. Those states which are ready and have land will ask for NIMZs. It is a policy framework which is applicable for the zones with certain benefits and incentives. The units will also be provided single-window clearance. 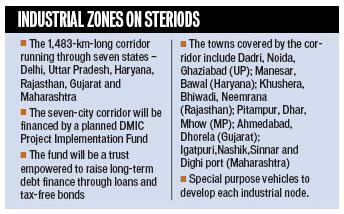 Second, the first seven regions have been identified under the DMIC (Delhi-Mumbai Industrial Corridor). So that is not where they will start looking for land; land is already there. So we are not talking in abstract. It is said that the tax incentives that will be provided for units within such industrial zones may lead to shifting of present industries from other areas into the zone, which would mean no additional employment generation. I shall not comment or speculate. These will be stand-alone, integrated industrial townships. So look at the positives and let’s not speculate on the negatives. So you will not allow shifting of present industries? These will come up in partnership with states. We are a federal country. It is a matter of detail. We will leave it to states. The policy says NIMZs will be sector-, location- and technology-neutral. What do you mean by that? How is the policy aiming to safeguard the interests of labour? When it comes to closure of a unit, which leads to immediate job loss, then as per the present law, compensation for 15 days of each year spent in employment will be provided. Now, the new option under the new law is a better option; it makes it 20 days. It makes for the labour dues to be paid immediately. Because it is through the creation of a sinking fund, an insurance cover or a combination of both. So the funds will be with the special purpose vehicle (SPV). If the unit shuts down, the labour dues will be made available. Also, the SPV has been mandated for redeployment of labour within the zone. If one unit closes, there will be five others who can take them. Delhi Mumbai Industrial Corridor (DMIC) and Dedicated Freight Corridor (DFC) are poised to be among the biggest industrial development projects in India, which will immensely boost public and private sector investment in the state. Being strategically located between both the western and eastern DFCs, UP has the potential to attract large scale investment in future. The state government has already planned over 3,500 acres of Special Economic Zone (SEZ), multiple railway terminals, container depots etc. “The private sector is expected to play a critical role in boosting the capacity of logistics infrastructure within UP,” Dedicated Freight Corridor Corporation of India (DFCC) director – Operation & Business Development P N Shukla said speaking at a conference on ‘Logistics Infrastructure: Key enabler for Sustainable Development’ organised by CII Western UP. DMIC envisages one industrial region (Dadri-Noida-Ghaziabad) and one industrial area (Meerut-Muzaffarnagar) within UP. These areas are proposed to be self-sustained industrial townships with world-class infrastructure viz road, rail and air connectivity, quality social infrastructure and provide a globally competitive environment conducive for businesses. UP serves as the first junction on the eastern DFC and about 55 per cent of the total 1,839 km of the eastern DFC passes through the state. Indian Railways intends to develop Multi-modal Logistics Parks (MMLP) through public private partnership (PPP) along the proposed eastern DFC at strategic locations. Since, UP is a critical state on this corridor, an MMLP is proposed at Kanpur. The Park is to be developed on PPP mode as a common user facility with direct rail connectivity and state of art infrastructure. 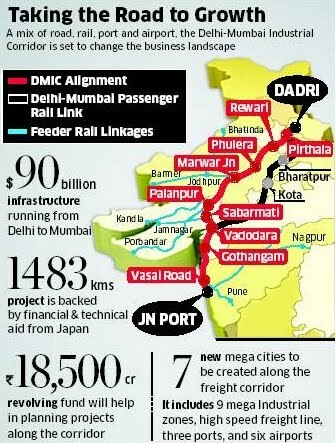 DMIC is a mega infrastructure project of 90 billion US dollars with financial & technical aid from Japan, covering an overall length of 1,483 km between Delhi and Mumbai. Under the project, multi-modal High Axle Load DFC has been proposed between the two cities and passing through UP, Delhi, Haryana, Rajasthan, Gujarat and Maharashtra with end terminals at Dadri in National Capital Region (NCR) and Jawaharlal Nehru Port near Mumbai. Distribution of length of the corridor indicates that Rajasthan (39 per cent) and Gujarat (38 per cent) together constitute 77 per cent of the total length of the alignment of freight corridor, followed by Haryana and Maharashtra 10 per cent each and UP and NCR 1.5 per cent of total length each. “Despite double dip recession, the growth has not hampered in India and projected growth for the 11th Plan period is likely to be around 8.5 per cent against the target of 9 per cent,” conference chairman Sankalp Shukla said. India Center Foundation chairman Vibhav Kant Upadhyay said holistic infrastructure and logistics policy was needed to promote sustainable development in the state. New Delhi, September 15, 2011The Cabinet on Thursday cleared the proposal for infusion of Rs 18,500 crore in the Delhi Mumbai Industrial Corridor Development Corporation (DMICDC). along the proposed Delhi-Mumbai dedicated rail freight corridor. At present, the government holds 49% in the DMIC project, while 51% is jointly held by Infrastructure Leasing and Financial Services (IL&FS) and Infrastructure Development Finance Company (IDFC). The investment regions include Dadri-Noida-Ghaziabad in Uttar Pradesh; Manesar-Bawal in Haryana, Khushkhera-Bhiwadi-Neemra in Rajasthan, Pitampura-Dhar-Mhow in Madhya Pradesh, Ahmedabad-Dholera in Gujarat, Igatpuri-Nashik-Sinnar and Dighi Port Industrial Area in Maharashtra. Each city would be a greenfield or a brownfield area with a combination of production units, public utilities, logistics, environmental protection facilties, residential areas, social infrastructure and administrative services. A corporate entity, DMICDC has been set up to undertake planning of the project, development of its various components, coordinating with stakeholders, monitoring of implementation and raising finances. NEW DELHI: The restructuring of the $90-Union cabinet on Thursday gave the thumbs up for the billion Delhi-Mumbai Industrial Corridor, or DMIC, after months of inter-ministerial consultations. The cabinet also approved a change in the holding structure of the company executing the project, which will see private sector promoters replaced by state-run financial institutions. "This project will be the largest infrastructure project in PPP mode with least investment and budgetary support coming from the government and this needs to be replicated throughout the country as an efficient urbanisation business model," DIPP Secretary RP Singh told ET. This project includes nine mega industrial zones of about 200-250 sq km, a high-speed freight line, three ports and six airports, a six-lane intersection-free expressway connecting Delhi and Mumbai and a 4,000-MW power plant. The Delhi Mumbai Industrial Corridor Development Corporation (DMICDC) will now set up an 18,500-crore revolving fund for financing trunk infrastructure such as sewage disposal and roads, with the government providing 35-40% of the financing through the various stages of the project. "An additional and equal amount will be put by the government of Japan," said a senior official involved directly with the project. The 51% stake of Infrastructure Leasing and Financial Services (IL&FS) and Infrastructure Development Finance Company (IDFC) in the company will be bought out by government-run financial institutions like LIC, among others. The government will continue to hold 49% in the venture. This move was initiated primarily to avoid conflict of interest given that both IL&FS and IDFC will be allowed to bid for projects part of the DMIC. According to sources, 60-65% of the projects will be structured on PPP basis. The Cabinet has also approved the setting up of a special purpose vehicle in each city where the Centre would contribute funds whereas land would be acquired by the state. "The SPV is primarily to raise long-term debt finance through required guarantees from the DMIC Project Implementation Trust Fund to make it viable for investments by insurance and pension funds," a DMICDC official told ET. The share of the Trust in these city SPVs is expected to be up to 50% but in projects that might be cut through cities the Trusts' share can be up to 100%, the official explained. The DMICDC is also expected to become a consultant for all state governments and SPV. The 1,500-km long Delhi-Mumbai Industrial Corridor would run across Uttar Pradesh, Haryana, Rajasthan, Madhya Pradesh, Gujarat and Maharashtra. In what could give a kick to big boost to infrastructure development and set the mood for major decision-making, the Commerce and Industry Ministry has moved the Cabinet note for the $90 billion Delhi-Mumbai Industrial Corridor (DMIC) project for the approval of Union Council of Ministers. “I have signed the file for the DMIC Cabinet note and hopefully it should get the nod of the Union Cabinet within a fortnight. The inter-Ministerial consultations have been completed,” Commerce and Industry Minister Anand Sharma told this correspondent. The project, being implemented in collaboration with Japan, was conceived some five years ago and envisages setting up of industrial corridor along the Delhi-Mumbai stretch. It will comprise seven new cities, nine industrial parks, three ports, six airports and a 1,483 km high-speed rail and road line will be developed as a trading hub. The project, spanning six States, will seek to create a business model out of urbanisation. The States covered by the project include Uttar Pradesh, Haryana, Rajasthan, Gujarat, Maharashtra and Madhya Pradesh. The new cities would come up along the proposed Delhi-Mumbai Dedicated Rail Freight Corridor. The Government has also completed the exercise for preparation of the perspective plan for the overall DMIC region. The cost of the project will depend on the cost of land and infrastructure development, a note by the Department of Industrial Policy and Promotion (DIPP) says. The project aims to create a strong economic base with a globally competitive environment and state-of-the-art infrastructure to activate local commerce, enhance foreign investment, create employment opportunities, enhance exports and attain sustainable development. The government has 49 per cent stake in the DMIC project, while Infrastructure Leasing and Financial Services has 41 per cent and Infrastructure Development Finance Company 10 per cent. The industrial corridor has proposed a revolving fund of Rs.18,500 crore to finance trunk infrastructure such as sewage disposal and roads, with the government providing 35-40 per cent of the financing. The proposed new cities will get Rs.2,500 crore while Rs.1,000 crore will be available for planning and project development. “The new national manufacturing policy and the DMIC project will give a big boost to infrastructure and generate millions of jobs for the youth in rural and urban areas,” Mr. Sharma said. Tokyo, Aug 26, 2011 (JCN Newswire via COMTEX) — Mitsubishi Heavy Industries, Ltd. (MHI) has reached an agreement with the Tata Group, India's largest business group, to conduct a feasibility study (F/S) for the creation of an environmentally friendly smart community which an MHI-led consortium has been promoting as part of India's Delhi-Mumbai Industrial Corridor (DMIC) development plan. As the leader of the consortium, MHI signed a memorandum of understanding (MOU) in India. DMIC is a mega infrastructure project on a scale of US$90 billion spanning an overall length of 1,483 kilometers between Delhi and Mumbai, India's political and commercial capitals, respectively. The master plan calls for development of the area within a corridor that will include industrial parks, power plants, airports, ports, railways, roads and commercial facilities. As part of DMIC, a smart community proposal looks to create energy-conserving, low-carbon, next-generation urban infrastructure through the introduction of multiple advanced energy-saving technologies and urban transportation systems. Based on a joint statement issued at the Japan – India Annual Bilateral Summit held in December 2009, in which Japan pledged to contribute to the promotion of a smart community and the DMIC development plan, Japan's Ministry of Economy, Trade and Industry (METI) has delegated the smart community F/S to six Japanese consortiums, including the one led by MHI. Besides MHI, the MHI-led consortium consists of Mitsubishi Electric Corporation, Mitsubishi Corporation, Mitsubishi Research Institute, Inc., and Electric Power Development Co., Ltd. (J-POWER). The consortium concluded its initial study and submitted a report to METI in March 2011, subsequent to which METI placed a follow-up order for an advanced study on commercialization of a smart community project in Gujarat state. Signing the MOU with the Tata Group, India's premier business group, has significant meaning for the MHI-led consortium. Participation of Tata Group companies in specific studies as powerful local partners will facilitate and accelerate the study and analysis phases of the project, the targets of which are to concurrently achieve sustainable economic growth in India and to establish a low-carbon society, primarily through introduction of energy-saving and environmentally friendly technologies. The scope of the F/S will be focused on a smart community platform and cover broad areas, including a smart factory, energy management system, water and waste solutions, lithium-ion battery applications for electric vehicles and an energy storage system, and a concentrated solar power system that utilizes solar thermal energy for power generation. The MHI-led consortium and the Tata Group will combine their respective technologies and capabilities so as to increase the feasibility of the smart community project. The consortium will submit a report on the F/S results by March 2012. Through proactive participation in this project together with the four other consortium member companies and the Tata Group, MHI aims to create a new business model leveraging Japan's advanced energy-saving, low-carbon technologies. Mitsubishi Heavy Industries, Ltd. , headquartered in Tokyo, Japan, is one of the world's leading heavy machinery manufacturers. MHI's diverse lineup of products and services encompasses shipbuilding, power plants, chemical plants, environmental equipment, steel structures, industrial and general machinery, aircraft, space rocketry and air-conditioning systems. For more information, please visit the MHI website at www.mhi.co.jp . The Indian government this week is set to approve the long-proposed US$90 billion (Dh330.57bn) Delhi-Mumbai industrial corridor – an ambitious infrastructure project on the long stretch connecting two of India's fastest-growing cities. Conceived five years ago, the corridor will be comprised of seven new cities, nine industrial parks, three ports, six airports and a 1,483km high-speed rail and road line will be developed as a trading hub. The project, spanning six states, will create a "business model out of urbanisation", India's department of industrial policy and promotion says. It is expected to breathe new life into the country's flailing industrial sector, which fell to a 20-month low last month to 53.6 from 55.3 in June, according to the HSBC Market Business Activity Index. The government owns a 49 per cent stake in the Delhi-Mumbai corridor project, while Infrastructure Leasing and Financial services owns 41 per cent, and Infrastructure Development Finance Company owns 10 per cent. The project, observers say, underscores the boom in India's infrastructure sector, currently expanding at a frenetic pace. India suffers from an "infrastructure deficit", says Kamal Nath, the urban development minister. The government is aggressively pursuing multibillion-dollar investments to overhaul the country's crumbling ports, choked airports, and pothole-ridden roads straining economic growth – shaving between 1 and 2 per cent from India's GDP. In June, Manmohan Singh, the prime minister, approved a new draft policy to create dedicated mass manufacturing and investment zones equipped with world-class infrastructure. The policy is geared towards raising the share of manufacturing in the country's GDP to 25 per cent from the current share of 15 per cent. The policy, if it takes off, is expected to generate 100 million jobs in the manufacturing sector by 2025. At present, the services sector is the main driver of India's economic resurgence – accounting for 55 per cent of the GDP, and only for 25 per cent of the jobs. Analysts say India needs not just software parks but also a large number of factory floors – like its Asian rival China – to absorb the millions entering its workforce each year. India will add about 150 million workers over the next 10 years, says Sonal Varma, an economist with Nomura Financial advisory and securities. "The employment elasticity offered by the services sector is not substantial enough to absorb them," she says. "India relies heavily on the manufacturing sector to absorb them." "If the manufacturing sector doesn't take off, it is hard to see India sustaining a growth rate of 9 or 10 per cent," says Jahangir Aziz, the chief India economist at the investment bank JPMorgan. But about 70 per cent of industrial projects in India are in limbo because of land disputes with farmers, according to a report titled "India Infrastructure – Paving the Way for India's growth", released jointly last year by Ernst & Young and the Federation of Indian Chambers of Commerce and Industry. "Every company I talk to tells me land titles and land records present some of the thorniest problems they face as they contemplate investing here in India," Jose Fernandez, the US assistant secretary of state for economic, energy and business affairs, told the Indo-American Chamber of Commerce in March. NEW DELHI: The Industry Ministry has circulated a draft Cabinet note for inter-ministerial consultation on the the development of new industrial cities under the Delhi-Mumbai Industrial Corridor project, Parliament was informed on Monday. Conceptualised in 2006, the USD 90 billion DMIC project, spanning the states of Uttar Pradesh, Haryana, Rajasthan, Gujarat, Maharashtra and Madhya Pradesh, is being developed in collaboration with Japan as a manufacturing and trading hub. The cities would come up along the Delhi-Mumbai Dedicated Rail Freight Corridor, which is under implementation. Preparation of the perspective plan for the overall DMIC region is complete, Minister of State For Commerce and Industry Jyotiraditya Scindia said in a written reply to the Lok Sabha. "A draft note for the Cabinet regarding the financial and institutional structure for the development of new industrial cities in the DMIC has been circulated for inter-ministerial consultations," Scindia said. The cost of the project will depend on the cost of land and infrastructure development, he said. However, the minister said the progress and implementation of projects in the DMIC will depend upon the availability of land, scale and size of projects and various approvals from state and central government agencies. In reply to another question in the House, Scindia said that currently, there is a ban on the export of wheat. "Whenever there is a scarcity or short supply of any product in the domestic market, government prohibits or restricts exports to ensure the availability of such products to consumers at reasonable prices," he said. The government has banned wheat exports since early 2007 to boost domestic supply and contain inflation. In an another reply, he said that as of July 28, 8,183 registered trademark files are missing from different trademark offices. New Delhi: Finance minister Pranab Mukherjee has agreed to provide R17,500 crore for the Delhi Mumbai Industrial Corridor (DMIC), in what could pave way for the Cabinet approval for the ambitious project that envisages creation of seven new cities along the corridor with a total investment of $90 billion. The plan is to set up industrial and infrastructure projects along the 1,483 km-long corridor linking New Delhi and Mumbai. With Mukherjee’s nod, the cabinet committee on infrastructure will consider the proposal shortly, official sources told FE. The project encompasses six states – National Capital Region of Delhi, Uttar Pradesh, Haryana, Rajasthan, Gujarat and Maharashtra. The government will invest R2,500 crore each in the seven cities to be developed. The project will be monitored and implemented by the Delhi Mumbai Industrial Corridor Development Corporation. Currently, Infrastructure Leasing & Financial Services (IL&FS) owns 41% in the firm and Infrastructure Development Finance Company (IDFC) 10%. This project incorporates nine mega Industrial zones of about 200-250 sq km, high-speed freight line, three ports and six airports, a six-lane intersection-free expressway and a 4,000 MW power plant. Several industrial estates and clusters, industrial hubs, with top-of-the-line infrastructure will be developed along this corridor to attract more foreign investment. The project will include both PPP viable and non-viable projects. According to official estimates, over 180 million people, almost 15% of the country’s population, will be impacted by the corridor. The project will be implemented in two phases. The first phase of the project will be completed by 2018. New Delhi: The department of industrial policy and promotion (DIPP) has decided to move the Cabinet to get the final nod for the the planned Delhi-Mumbai Industrial Corridor (DMIC). The R18,500-crore project would create seven new cities in the first phase. The DIPP has already received the approval from other related ministries like water resources, urban development, railways for the project and is awaiting the response of the finance ministry. According to official sources, each city needs an investment of R2,500 crore, adding up to an investment of R17,500 crore. Another R1,000 crore will be required for the preliminary project development. The required funds will be raised both through debt and equity. The DMIC is being developed on the public-private partnership model with the government partnering with IL&FS and the IDFC. The DMIC was conceived in 2006 and is expected to build internal roads, solid waste disposal, flood management, storm water and sewerage system, bus and rail-based public transportation system and landscaping. The project covering Uttar Pradesh, Haryana, Rajasthan, Gujarat, Maharashtra and Madhya Pradesh in collaboration with Japan as a manufacturing and trading hub, is expected to see first seven cities which will come up along Delhi-Mumbai Dedicated Rail Freight Corridor. Apart from this, the new cities and sub-cities will be developed around the industrial nodes of Kushkhera-Bhiwadi-Neemrana in Rajasthan, Dadri-Noida- Ghaziabad in Uttar Pradesh, Bharuch-Dahej in Gujarat, Igatpuri-Nashik-Sinnar in Maharashtra and Pitampura-Dhar-Mhow in Madhya Pradesh. After these seven cities the next phase will develop 17 more cities which are planned to be developed on a similar pattern. NEW DELHI: Industry Ministry has sought Rs 18,500 crore to develop seven cities around the Delhi-Mumbai Industrial Corridor (DMIC), that will criss-cross six states. The USD 90-billion DMIC project, planned in 2006 comprising — Uttar Pradesh, Haryana, Rajasthan, Gujarat, Maharashtra and Madhya Pradesh — is being developed in collaboration with Japan as a manufacturing and trading hub. The cities would come up along Delhi-Mumbai Dedicated Rail Freight Corridor which is under implementation. "Soon we will prepare the Cabinet note seeking funds " a source said. Out of the total amount, Rs 17,500 crore would be used to create infrastructure like internal roads, solid waste disposal, flood management, storm water and sewerage system, bus and rail-based public transportation system and landscaping. For preliminary work of the project (as a Project Development Fund), DIPP has sought Rs 1,000 crore. New cities and sub-cities will be developed around the industrial nodes of Kushkhera-Bhiwadi-Neemrana in Rajasthan, Dadri-Noida- Ghaziabad in Uttar Pradesh, Bharuch-Dahej in Gujarat, Igatpuri-Nashik-Sinnar in Maharashtra and Pitampura-Dhar-Mhow in Madhya Pradesh. Later, 17 more cities are planned to be developed on a similar pattern. The money from the Centre would be both in the form of debt and equity which would be ploughed into the Delhi Mumbai Industrial Corridor Development Corporation Limited (DMICDC), which is a joint venture between the government, IL&FS and IDFC. "This investment is necessary to create basic infrastructure so that industrial and trading activities can come up," the source said. This money has to be put in by the government even before public-private-partnership (PPP) business model can be developed, the source added. About Rs 2,500 crore would be spent on each city to develop basic infrastructure. Ajay Kaul Astana (Kazakhstan), Apr 15 (PTI) Notwithstanding the tragedy suffered by it, Japan has conveyed to India that its assistance and partnership to projects like Delhi-Mumbai Industrial Corridor (DMIC) and Dedicated Freight Corridor(DFC) would continue as per the plans.The assurance was conveyed during the visit of Foreign Secretary Nirupama Rao to Tokyo last week, sources said. "Japan has told us that it has all reasons to go ahead with DMIC and DFC," the sources said while discounting apprehensions that such major projects being constructed with Japanese cooperation may be hit.There is also no indication that its assistance to India would be cut. Japan is the largest contributor of Overseas Development Assistance (ODA) to India.Japan suffered devastation from tsunami last month and is in the process of reconstruction. The sources said Japan feels that continuance of projects like DMIC and DFC would go on to help its own economy.DMIC is a mega infra-structure project that will cost USD 90 billion with the financial & technical assistance from Japan. The ambitious project will cover an overall length of 1483 KMs between India and Mumbai passing through various states.A MOU was signed in December 2006 between Vice Minister, Ministry of Economy, Trade and Industry (METI) of Government of Japan and Secretary, Department of Industrial Policy & Promotion (DIPP). A Final Project Concept was presented to both the Prime Ministers during the then Japanese Prime Minister Abe's visit to India in August 2007.Subsequently, Government of India has announced establishing of the Multi-modal High Axle Load Dedicated Freight Corridor (DFC) between Delhi and Mumbai, covering an overall length of 1483 km and passing through the six states – Uttar Pradesh, Delhi, Haryana, Rajasthan, Gujarat and Maharashtra, with end terminals at Dadri near Delhi and Jawaharlal Nehru Port near Mumbai.Distribution of length of the corridor indicates that Rajasthan (39 per cent) and Gujarat (38 per cent) together constitute 77 per cent of the total length of the alignment of freight corridor, followed by Haryana and Maharashtra – 10 per cent each – and Uttar Pradesh and National Capital Region of Delhi – 1.5 per cent of total length each.This Dedicated Freight Corridor envisages a high-speed connectivity for High Axle Load Wagons (25 Tonne) of Double Stacked Container Trains supported by high power locomotives.The Delhi-Mumbai leg of the Golden Quadrilateral National Highway also runs almost parallel to the Freight Corridor.This corridor will be equipped with an array of infrastructure facilities such as power facilities, rail connectivity to ports en route etc. Approximately 180 million people, 14 per cent of the population, will be affected by the corridor�s development. A year after signing a memorandum of understanding with the Delhi-Mumbai Industrial Corridor Development Corporation (DMICDC), which will develop a dedicated freight corridor passing through six states, the Uttar Pradesh government has formed a high-level committee to speed up the process of finalising the projects in the state. Sources said while states like Madhya Pradesh, Haryana, Gujarat and Maharashtra were making progress in the projects, UP and Rajasthan lagged behind. The new committee will have as members chairmen of authorities of Noida, Greater Noida and Yamuna Expressway, district magistrates of Gautam Budh Nagar, Ghaziabad and Bulandshahr and a special secretary from the Uttar Pradesh Industrial Development Department. Apart from identifying the areas and the projects to be taken up in the corridor, the committee would also co-ordinate with the Government of India for getting necessary clearances. “About 200 km of about 1,500 km long corridor falls in UP, but the state is also important in view of the fact the starting junction of both western and eastern freight corridors fall at Dadari in UP,” said an official. He added, “In the first phase, six investment zones have been identified for development. Of these, the Dadari-Noida-Ghaziabad investment region falls in UP. The committee will propose projects for the region, identify the areas to be developed and also propose institutional structure of the area on the guidelines of DMICDC”. The Delhi-Mumbai Industrial corridor was conceived in 2006. During a visit by Prime Minister Manmohan Singh to Japan in December the same year, the Japan government showed interest in development of this corridor and an MOU between the two government was signed. The Delhi-Mumbai Industrial Corridor Development Corporation was formed as a special purpose vehicle by the Union Ministry of Railways. Later, MOUs were also signed with UP, Haryana, Gujarat, Rajasthan, MP and Maharastra. An official said about 25 “early bird projects” have been proposed in six states covered by the corridor and four of these are in UP. These include development of a modern rail terminal at Boraki in Greater Noida, a container depot for goods at Dadari along with a “multi-modal logistics hub”, a power station in Greater Noida and development of an international airport in the region. New Delhi, Feb 25 (PTI) Railway Minister Mamata Banerjee today said the ambitious Rs 77,000 crore Dedicated Freight Corridors (DFC) project is on schedule and the work on Ludhiana-Dankuni section has commenced. Presenting the Railway Budget for 2011-12 here, she said, "I am extremely happy to announce that work from Dankuni end on the Eastern Corridor (Ludhiana-Dankuni) has already started. We want to complete the DFC project by December,2016 as scheduled." In 2005, the Ministry of Railways had announced the plan to build about 2,762 km long dedicated corridor for its freight movement on two routes. While the Eastern Corridor was proposed from Ludhiana to Dankuni, the Western Corridor was to be constructed from Jawahar Lal Nehru Port, at Nhava Sheva near Mumbai to Tughlakabad, Delhi/Dadri. The project, estimated to cost about Rs 77,000 crore, includes interlinking of the two routes at Khurja in Uttar Pradesh. "The main loan agreement for phase I of Western Corridor of DFC with Japan International Cooperation Agency (JICA) has been signed and bidding process for civil and track work has commenced," she said, while adding that "for the Eastern Corridor, the appraisal by World Bank for Khurja-Bhaupur section would be carried out next month". Stating that land is a sensitive issue, Banerjee said that to reduce the number of land losers, efforts were being made to bring the alignment of the DFC parallel to the existing railway network, thereby using 12,000 acres from railways'' own land bank. "It has also reduced the requirement of land acquisition by 2,718 acres resulting in a saving of about Rs 300 crore," she said. It could be the most challenging job any executive could have taken up in recent times. As CEO and managing director of the Delhi Mumbai Industrial Corridor Development Corporation (DMICDC), Amitabh Kant heads a project that could transform India altogether. It is daunting in its vision, mind boggling in the amount of money that would be required to see this project through. The project involves developing industrial areas on either side of the Dedicated Freight Corridor (DFC) which is meant to travel from Rewari in Haryana through Delhi, Rajasthan, Madhya Pradesh and Gujarat to end in Mumbai. The Delhi Mumbai Industrial Corridor (DMIC) could involve a fund outlay of not less than $120 billion, and could soar even beyond. It is being developed by the Government of India in partnership with the Government of Japan as a global manufacturing and investment destination supported by world class infrastructure and enabling policy framework. Kant is a member of the Indian Administrative Service (Kerala Cadre: 1980 batch). He is also the author of Branding India — An Incredible Story and has been the key driver of the “Incredible India” and “God’s Own Country” campaigns that positioned and branded India and Kerala as leading tourism destinations. He was then joint secretary, ministry of tourism, Government of India. He had also served as secretary, tourism, Government of Kerala, managing director, Kerala State Industrial Development Corporation, district collector, Kozhikode and managing director, Matsyafed. Kant was also the National Project Director of the Rural Tourism Project of UNDP which made a paradigm shift in spreading tourism to Indian villages which had core-competency in handicrafts, handloom and culture. R N Bhaskar of DNA met him at his Delhi office and Kant spoke about the underlying philosophy behind this ambitious project. How do you view the DMIC project which you are in charge of? The basic objective of the DMIC is to drive manufacturing. This is because only then can India hope to keep growing at 9-10% year-on-year. That is the only way India can hope to wipe out poverty. If this growth rate slows down, poverty alleviation will become that much more difficult. Are there any models that you have been looking at? Historically, this has happened in Japan, Korea, Singapore and China. They, too, focused on manufacturing and pulled their respective economies out of backwardness to become some of the most vibrant economies in the world. This is because manufacturing creates jobs. And manufacturing alone can help India triple employment and double exports over a period of time. But hasn’t India’s service sector been the prime mover of its economic growth during the past 15 years? True, India’s growth has been driven by the service sector so far, but this sector is not as great a creator of jobs as the manufacturing sector is. Today, agriculture has 45% of India’s employment, which grows at just 2-3%. Nowhere in the world has agriculture grown at 10% year-on-year for a very long period of time. India has to get into value-added manufacturing. Moreover, disguised employment must shift from agriculture to manufacturing. And in doing so, we have to change India’s work culture as well. To succeed, the industrial units in the DMIC area will have to be those which benchmark their production to the world’s best. Nothing must be second rate. And to do that, this quest for excellence must begin with the very planning of the DMIC. Is that why you have been looking at the best master-planners for the cities proposed in the DMIC region? True. And the list is impressive. We have Scott Williams looking at the perspective plan for the overall DMIC corridor. Then we have two consortia led by Halcrow. One is focused on the Ahmedabad-Dholera Investment Region in Gujarat, and the other on the Dadri-Noida-Gaziabad region in UP. We have another consortium led by LEA Associates which is looking at the Pithampur-Dhar-Mhow investment region in MP. The Jurong consortium is looking at the Manesar-Bawal region in Haryana. Two other consortia, led by AECOM, are looking at both the Igatpuri-Nashik-Sinnar node and the Dighi Port industrial area. Finally, we have the consortia led by Kulper Compagnons working on the Khuskera-Bhiwadi-Neemrana region in Rajasthan. Each of these consortia are in turn using the skills of many other consultants who can ensure that the master plan produced is extremely comprehensive, and benchmark to the best in the world. Look at all the countries that developed at a rapid pace, be it Singapore, Korea or China. They all created well-planned large manufacturing cities.They built them so that the largest and the best manufacturers from around the world could congregate there. And they create large-scale employment. For instance, in China, there is a factory which has almost 750,000 workers in one place. You cannot get workers to come to a place and work there for a reasonably long period of time, unless they can come with their families. Young managers have young wives, and they will have children. Children need schools. Then you need hospitals, cinema houses and other social interaction points. In other words, you need to look at manufacturing from the viewpoint of people who can work there, live there and play there. This means identifying all such areas before a city can be built. To ensure that you do not waste fuel or time and you have clean air to breathe, you need to ensure that no place of work or entertainment is more than 10 minutes away from a highly-efficient commute system — be it rapid bus transport system or metro rail. Unlike older cities, that had the luxury of being sprawled out because they had access to plenty of cheap oil or coal — which in turn could allow the use of private vehicles like cars — all new cities are, and have to be, built more compactly. This saves on commute time, it allows for more efficient and comfortable public transport systems, short distances for sewerage systems to be laid out, and brings all types of places and people close to each other. They help reduce CO2 emissions which is something older cities did not bother about. And by planning the city carefully, you also ensure that you have enough open spaces for recreation. Let me give you one example. Both Barcelona and Atlanta were built at around the same time. But because of the way both were designed, Atlanta today accounts for 12 times more CO2 emissions than Barcelona. Atlanta is more sprawled out, and has many more vehicles plying the roads. In Barcelona, on the other hand, the city is more compact and better planned.Almost 60% of the people cycle or walk to get to anywhere. And if Atlanta were to become as environment-friendly as Barcelona, it will have to create 2,486 new metro stations. That is just not feasible. You just cannot re-design a city. That is why master-planning is critically significant. But won’t this affect the very design of cities as we have known them? True. This is how the concept of manufacturing has converged with the concept of urbanisation. That is why the new cities will have to climb vertically, with FSI, (floor space index) or FAR (floor area ratio) at not less than 4. Buildings should be as close to the workplace as possible. And if the workplace is not very close, the building must be close to a public commute hub. A similar logic holds true for offices as well. And since you want to have compact cities, connectivity with other cities and opportunities has to be excellent. That is why no city can take off without transport connectivity. In fact, that is true of manufacturing as well. In India the challenge will be to connect highways, railways and ports to these new cities. Since it is not easy to move a port, or a highway to a city, most cities grow around transport hubs. The dedicated freight corridor (DFC) enables the effective creation of such transport hubs. It is next to a dedicated freight corridor, and the nodal points identified by us, already have excellent connectivity. That is why I always say that DMIC is all about realising India’s urbanisation process. In many ways India is a late starter in terms of new urbanisation. This was because India’s policy-makers were obsessed with rural development. They believed that it would be possible to create enough jobs in rural areas. To my mind this is not possible. The moment you create enough jobs, you turn a rural area into an urban area. And if this urban area is not planned right from its initial stages, you will have a highly unplanned — and even an unconnected — city. In fact, if you don’t plan big cities well in advance, people will move to existing cities which will expand in an unplanned way, leading to a proliferation of slums. You need magnet cities that can take the influx of people looking for jobs. You need to wean them away to the new cities, so that the temptation of going to old cities will diminish. If you don’t have planned growth, you will have unplanned growth. And that means more slums. It will mean more contrasts between affluence and poverty. It is something that should be avoided. India should have begun doing this many years ago. But if India is a late starter, it has one big advantage. It can use new technology to leapfrog over other countries. In today’s world, it is possible to use digital technology and use it with physical infrastructure. It is possible to use instrumentation and interconnection. You can converge them horizontally. And since one has technology, the time taken to build a city will also have to be crunched. There will have to be less wet processes — like the use of mortar for laying bricks for walls. Instead you will have more and more use of steel and glass. This will allow structures to come up speedily and look more majestic as well. And you will have to stop looking at power, water, transportation and sewage management separately. With technology and foresight, you can create a central command room to manage all. This would mean excellent management for managing the cities, isn’t it? True. But then if you look at any new city in the world — Shanghai, Seoul, Singapore — which is both a city and a country — even Tokyo or Osaka, you will find them governed by very powerful CEOs or mayors. You need to make one person responsible for the maintenance and growth of the city, and see that its planning does not go awry, and its growth does not falter. Will all these be easy? We have two challenges before us. The first is to ensure that these cities are well financed. Earlier, all the cities — whether in the US or in China — were entirely state-funded. The challenge will be to get these funded as public private partnerships (PPPs), with part of the funding coming from the private sector. In this, the government has a major role. It needs to clear the financial structuring of the city. These new cities cost money. The first seven cities that we plan help develop (see the box) will cost anywhere between `35,000 crore and as much as `75,000 crore — which is what Dholera, the largest development plan among all the cities, is likely to cost.And mind you, these are present day costings. To get these cities off the ground, the government has to create good quality trunk infrastructure. This includes drainage, sewerage, roads and other non-commercial parts. All these must be in accordance with the master plans for which we have hired the best of the consultants. Once this is done, it allows you to structure, balance and co-operate on PPP. It allows you, in turn, to monetise the land that has been allocated for the city, and the funds from which could then fund other development. The second challenge is to get India to create a business model of urbanisation. These cities must be able to constantly generate revenues and put them back to finance further growth and also meet maintenance and administrative costs. What we at DMICDC are trying to do is to create this model so that it can then be replicated in other parts of the country. In other words, government must trigger growth. This growth, and the increased commercial value of land and facilities, must lead to PPPs. The challenge is to find out the lowest minimum money that DMICDC will need from the government to trigger growth. The challenge is to get long term debt, because cities that are being set up will not generate returns for at least 10-15 years. After that they generate enough money to not only repay earlier loans, but also create enough funds to finance many more cities. The challenge is that of governance as well — of having strong CEO- administrators for the cities. They could be strong mayors. The biggest city you plan work on is Dholera. Could you elaborate on that? If all goes according to what we and thegovernment of Gujarat have planned, Dholera could be India’s biggest industrial and residential hub. In fact, it could be the world’s largest as well. Consider the following. Dholera accounts for almost 50,000 hectares compared to most other new cities in India that account for just one-third its size. In fact, the state government of Gujarat has been the most proactive among the six states that the DMIC covers. It has already acquired some 27,000 hectares of land, and work is under way for acquiring the rest. Site surveys have already begun, and the Dholera-Ahmedabad 16-18 lane highway is now being planned. We expect this area to become one of the biggest beneficiaries of the plan that DMIC has. We believe that this city will be humming in around five years. So how far have you reached with other states? We are currently working in partnership with state governments. We are dealing with land-owners, but it is a challenging job. We are trying to create one or two demonstration models which can be replicated in other places. That, to my mind, is the basic difference between India and China. In China it is easy to get in and achieve something big. But doing this may not be sustainable in the long run. That is why we would like to first create a sustainable model which triggers competition among states to create similar cities. Mr Anand Sharma commerce and industry minister has proposed the establishment of a USD 9 billion revolving fund with matching contribution from India and Japan to kick start the implementation process of the USD 100 billion Delhi Mumbai Industrial Corridor Project. The statement said that Mr Sharma's proposal came in response to the Japanese Prime Minister, Mr Naoto Kan's call for a partnership in the development of India's infrastructure, especially the DMIC project. During the 20 minute long meeting with Mr Sharma in Tokyo on Tuesday, the Japanese Premier agreed to enhance the financial contribution of Japan and was receptive to Mr Sharma's proposal. Mr Sharma highlighted the importance attached by India to the DMIC project, which has now decisively moved from the stage of master planning to project implementation. The project is being seen as a flagship initiative of India-Japan partnership. Mr Sharma will hold bilateral meetings with the Japanese Minister of Economy, Trade and Industry, Mr Banri Kaieda to review the progress of DMIC project. He will interact with top Japanese CEOs to seek Japanese investments in India in DMIC and in other areas of priority as identified at the Summit level interaction between the Prime Ministers. Mr Sharma called for greater Japanese investments in India's infrastructure and capital goods equipment sector including power generation where Japanese companies have a technological edge. Meanwhile, Mr Kan underscored the significance of India-Japan technology collaboration for research and innovation. Mr Kan expressed satisfaction on the conclusion of negotiations for an India-Japan Comprehensive Economic Partnership Agreement. Mr Sharma said that India viewed its partnership with Japan as a ‘strategic engagement' in the region and in the global context. come up alongside the proposed Delhi-Mumbai dedicated rail freight corridor. "The government will provide Rs500 crore per year per industrial city to a fund for the next five years beginning 2011-12, as grant for the creation of capital assets to catalyse the development of these cities," said a government source, who did not wish to be identified. Another Rs 200 crore every year will be set aside from the Budget that would be used by the Delhi Mumbai Industrial Corridor Development Corporation (DMICDC) to build infrastructure. The resources will be parked in a corpus known as the DMIC Project Implementation Fund. The fund will be established as a trust empowered to raise long-term debt finance at attractive rates from institutions and also issue tax-free bonds. The industrial belts covered by the plan are: Dadri-Noida-Ghaziabad in Uttar Pradesh; Manesar-Bawal in Haryana, Khushkhera-Bhiwadi-Neemrana in Rajasthan, Pitampura-Dhar-Mhow in Madhya Pradesh, Ahmedabad-Dholera in Gujarat, Igatpuri-Nashik-Sinnar and Dighi Port Industrial Area in Maharashtra. The fund will be administered by Board of Trustees chaired by secretary, department of industrial policy and promotions, with representatives from the departments of economic affairs and expenditure, the Planning Commission and the chief executive of the DMICDC. "The board of trustees will decide the optimal mix and choice of financial instruments along with suitable terms and conditions," the source said. Each city will have production units, public utilities, logistics facilities, environmental protection facilities, social infrastructure and administrative services. The central government's contribution to the fund would be used as a revolving corpus. A special purpose vehicle (SPV) would be created under the Companies Act for each industrial city node. The SPVs will function as the development authority and double as municipal administration. Managing urban development to keep pace with internal migration is a major challenge for India. As more people shift from agriculture to industry and services, cities are faced with a massive influx of migrants. Given limited capacities, urban infrastructure is bursting at the seams. World Bank projections show urban centres accounting for 40% of India's population by 2030 and crossing 50% by 2040-45. Given our traditional lacklustre attitude towards urban development – thanks to a political bias in favour of rural India – our cities are looking at bleak futures unless we tackle the issue now. It is in this backdrop that the Delhi-Mumbai Industrial Corridor (DMIC) project to build new futuristic cities assumes significance. Expansion of existing urban metropolises is insufficient to deal with demand. By 2020, there will be a shortfall of 30 million urban dwelling units, 200 million water connections and 160 GW of power. In many cases, such as Delhi and Kolkata, expansion is simply not possible due to constraints on land. Short of Baron Haussmann's forcible renovation of Paris in the 19th century to decongest the French capital, building new cities from scratch is the best way to quickly create urban infrastructure. Based on model urban cities such as Suzhou in China and Songdo in South Korea, the DMIC project envisages a total of 24 'smart cities' spanning six states. On completion, they will boast of state-of-the-art infrastructure with centrally integrated civic services such as water, power and sewage disposal. The lesson from the Delhi experience is that a multiplicity of authorities only leads to confusion in urban development. A central body that oversees all services will be far more efficient in coordinating public works and repair. An integrated, accessible public transport system is the foundation of smart cities and a much-needed antidote to the chaos that the burgeoning number of private vehicles is creating in urban India. This entails creating multiple transportation options that smoothly feed into each other. Energy efficiency and clean technology must be the watchwords. All of these will only be possible if there is sufficient devolution of power in favour of strong city governments. Whether it is New York, London or Tokyo, great cities have empowered local councils to manage affairs of development. Mumbai is a classic example of a city where infrastructure woes are directly linked to the absence of an effective local government besides negligence of state authorities. New cities must be provided with strong mayoral institutions to avoid a similar fate. For inclusive growth, we need new cities not just along the DMIC corridor but in the rest of the country as well. NEW DELHI: India`s Shanghai dream has shifted base, from Mumbai to the futuristic cities that are being planned along the Delhi-Mumbai Industrial Corridor (DMIC). Masterplans are ready for seven brand new cities spanning six states in what will be the biggest urban development project since Chandigarh was built in 1953. The blueprints are inspired by industrial hubs in China and South Korea and have the potential of revolutionizing the country`s urban landscape with the introduction of what modern town planners call “smart city“ concepts. Their key features are compact, vertical developments, an efficient public transportation system, the use of digital technology to create smart grids for better management of civic infrastructure, recycling of sewage water for industrial use, green spaces, cycle tracks and easy accessibility to goods, services and activities designed to foster a sense of community. Plans are also in place to integrate these cities through new airports, new rail links and arteries of ten-lane highways. The creation of a new urban vision was not the original intention, though. The DMIC was an economic and commercial initiative of the government, intended to boost manufacturing through the development of industrial centres along the western leg of the Mumbai-Delhi-Kolkata dedicated railway freight corridor. "As we went along and looked at the international experience, we realized that we needed to go beyond that," said Amitabh Kant, CEO and managing director of the DMIC Development Corporation. "We needed to create new generation cities in which people can live, work and play. We needed cities with outstanding infrastructure and quality of life." Experts from the US, UK, Singapore and the Netherlands were called in and what emerged could radically change the approach towards urbanization in a country that is considered a “reluctant urbaniser“ compared to other Asian countries. A total of 24 such new generation cities are being planned for phased development across UP, Haryana, Rajasthan, Madhya Pradesh, Gujarat and Maharashtra. The first phase will see seven of them opening their doors by 2018-19. The processes of acquiring land, getting government clearances and generating investment have already started. The estimated cost of building the new cities varies from Rs 30,000 crore to Rs 75,000 crore at current prices, depending on their size. The central and state governments will carry the burden of financing trunk infrastructure while a public-private partnership model is being tried out for the first time to build houses, schools, hospitals and other facilities. The masterplans for the cities are unique in that an effort has been made to look at the future by putting in infrastructure ahead of the demand. "We have planned for 2040," said Kant. Some of the ideas are truly innovative. For instance, each city will have underground utility corridors for parking, sewage disposal and communication lines to give it a neat look and leave enough space for facilities that are missing in most existing cities, like pavements, parks and cycle tracks. The transportation axis is designed to discourage the use of private vehicles. The emphasis will be on dedicated bus and light rail corridors. The rule that the planners have tried to follow is that some form of public transport should be available within a 10-minute walk from home or office. The city plan is polycentric with mixed land use so that residents can live, shop and relax close to their place of work. DMIC Delhi Mumbai Industrial Corridor Delhi-Mumbai Industrial Corridor is a mega infra-structure project of USD 90 billion with the financial & technical aids from Japan, covering an overall length of 1483 KMs between the political capital and the business capital of India, i.e. Delhi and Mumbai. Finally Government of India has announced establishing of the Multi-modal High Axle Load Dedicated Freight Corridor (DFC) between Delhi and Mumbai, covering an overall length of 1483 km and passing through the six States – U.P, NCR of Delhi, Haryana, Rajasthan, Gujarat and Maharashtra, with end terminals at Dadri in the National Capital Region of Delhi and Jawaharlal Nehru Port near Mumbai. Distribution of length of the corridor indicates that Rajasthan (39%) and Gujarat (38%) together constitute 77% of the total length of the alignment of freight corridor, followed by Haryana and Maharashtra 10% each and Uttar Pradesh and National Capital Region of Delhi 1.5 % of total length each. This Dedicated Freight Corridor envisages a high-speed connectivity for High Axle Load Wagons (25 Tonne) of Double Stacked Container Trains supported by high power locomotives. The Delhi – Mumbai leg of the Golden Quadrilateral National Highway also runs almost parallel to the Freight Corridor. This corridor will be equipped with an array of infrastructure facilities such as power facilities, rail connectivity to ports en route etc. Approximately 180 million people, 14 percent of the population, will be affected by the corridor’s development. This project incorporates Nine Mega Industrial zones of about 200-250 sq. km., high speed freight line, three ports, and six air ports; a six-lane intersection-free expressway connecting the country’s political and financial capitals and a 4000 MW power plant. Several industrial estates and clusters, industrial hubs, with top-of-the-line infrastructure would be developed along this corridor to attract more foreign investment. Funds for the projects would come from the Indian government, Japanese loans, and investment by Japanese firms and through Japan depository receipts issued by the Indian companies. This high-speed connectivity between Delhi and Mumbai offers immense opportunities for development of an Industrial corridor along the alignment of the connecting infrastructure. A band of 150 km (Influence region) has been chosen on both sides of the Freight corridor to be developed as the Delhi-Mumbai Industrial Corridor. The vision for DMIC is to create strong economic base in this band with globally competitive environment and state-of-the-art infrastructure to activate local commerce, enhance foreign investments, real-estate investments and attain sustainable development. In addition to the influence region, DMIC would also include development of requisite feeder rail/road connectivity to hinterland/markets and select ports along the western coast. Delhi-Mumbai Industrial Corridor is to be conceived as a Model Industrial Corridor of international standards with emphasis on expanding the manufacturing and services base and develop DMIC as the 'Global Manufacturing and Trading Hub'. The Government is considering this ambitious project to establish, promote and facilitate Delhi-Mumbai industrial corridor to augment and create social and physical infrastructure on the route which is world class and will help spurring economic growth of the region. • A State-level Coordination Entity/ Nodal Agency responsible for coordination between the DMICDC and various state government entities and the project implementing agencies/ special purpose vehicles. • Project specific special purpose vehicles (SPVs) who would actually implement the projects. These SPVs can be owned by state Governments in terms of governance structure, Board of Directors etc. Some of these SPVs can also be formed by central/state governments and their agencies. The corridor project likely to be implemented in two phases namely – Phase-I & Phase-II. An estimated $90 to $100 billion would be required to create the infrastructure in the first phase of the project. Japanese companies are expected to invest over $10 billion in the proposed corridor during the first phase. Preliminary discussions with the state Government also indicate that sufficient land is available for this purpose. This investment region would be located within 50km from the alignment of Dedicated Freight Corridor and the nearest metropolitan region is Delhi, the National Capital of India. The proposed Dadri-Noida-Ghaziabad Investment Region would be located close to Delhi, the National Capital. This region has good connectivity by road and rail to rest of India. Besides, it comprises of Noida, the vibrant satellite town of Delhi with IT/ITES and electronics industries; Ghaziabad, the hub of light engineering and electronics industries; and Greater Noida, the city with well developed road network, state of the art physical and social infrastructure with quality residential commercial, recreational and institutional areas. Moreover, a 3500MW power plant is being developed close to Dadri through private sector participation. The proposed investment region has the advantage of availability of good connectivity by road, rail and air, besides quality urban infrastructure.
. Well Established IT/ITES Base in Noida and Greater Noida with quality commercial, residential and institutional infrastructure.
. Proposed Free Trade Warehousing Zone (FTWZ) at Greater Noida.
. 3500MW Power Plant being implemented at Dadri through private sector participation. – Connectivity with two National Highways, NH-24 (Delhi-Lucknow), NH- 58 (Delhi-Haridwar-Mana Pass). Widening and strengthening to four-lane dual carriageway is being carried out for both National Highways under Phase-3A and 3B of NHDP. – Would be served by proposed Eastern Peripheral Expressway (Ghaziabad-Noida-Palwal & Kundli-Ghaziabad) of the National Capital Region of Delhi. – Investment region will have the advantage of being located close to Dadri Junction, where the alignments of the Eastern (Delhi-Kolkata) and Western (Delhi-Mumbai) Dedicated Freight Corridors meet besides the existing Delhi-Meerut-Lucknow Broad Gauge Connectivity. – With respect to Air connectivity, Delhi International Airport and proposed Greater Noida Airport will offer the air connectivity to the region. North Western Uttar Pradesh i.e. the Dadri-Noida-Ghaziabad belt is proficient at manufacture of engineering, electronics, and leather and textile goods. A large industrial park would give a boost to the production and export of these items. With a focus on expansion of industrial activities, creation of supporting infrastructure and facilitate further investments in the sector to develop a mega industrial zone. It is proposed to augment two industrial estates in Ghaziabad. Considering the large agricultural output from the Western Uttar Pradesh, an integrated agro/food processing zone is proposed in this region. Noida/Greater Noida is ably competing with Gurgaon as the preferred location for IT/ITES companies desirous of setting up/expanding their operations. Biotechnology is an upcoming industry sector that needs to be given thrust in the DMIC area. To support the IT/ITES/Biotech Hubs as well as the other industries in the investment region, a Knowledge Hub/skill up gradation centre would be imperative. It is advisable to set it up in this area, which is close to the National Capital Region and has a substantial "trainable" population. Potential sectors could include Agro Processing, Engineering, Leather/ Handicraft and IT/ITES/Biotechnology sectors. Expansion of the existing Inland Container Depot at Dadri and establishment of a Logistic Park have been proposed. This region would be provided with an integrated township with residential, institutional, commercial and leisure/recreation infrastructure which could be dovetailed to requirements of specific investor groups/ countries. – Providing linkage to NH-24 and NH-58. – Augmentation of State Highway connecting Ghaziabad-Aligarh-Agra. – Connectivity to Greater Noida/Delhi and Faridabad/NH2 and to Faridabad-Noida-Ghaziabad and Kundli-Ghaziabad Expressways. – Development of requisite grade separators/flyovers/interchanges and underpasses along the National Highways/ State Highways and access roads for uninterrupted freight and passenger movement to the region would also be included in the development of feeder links. – Linkage to/from container terminal and with Western DFC at Dadri. – Augmentation of Meerut-Dadri-Ghaziabad, Ghaziabad-Aligarh-Hathras route. – Development of Feeder Rail links also includes construction of underpasses wherever required so as to avoid level crossings. – Development of Regional MRTS network between Ghaziabad, Noida and proposed Greater Noida International Airport at Jeur as well as between Greater Noida International Airport and Palwal/Faridabad. The proposed Meerut-Muzaffarnagar Industrial Area would be located at a distance of 100 to 150km from Delhi, the National Capital. This region has good connectivity by road (NH-58 and other State Highways) and rail (Delhi-Meerut-Lucknow/Saharanpur) to rest of the State and India. The proposed investment region has the advantage of availability of good connectivity by road and rail. Being located in the rich agricultural zones of the state, this region offers wide opportunities for agro-processing industries.
. Caters to the rich agricultural produce (Mango, Basmati Rice, Potatoes and other vegetables) of Meerut and Muzaffarnagar as well as from surrounding districts as Bijnor, Jyothibaphule Nagar and Saharanpur of the state.
. Meerut is renowned for production of sports goods. Besides this, Meerut is the base for other medium and large scale industries in automobile, alcohol, paper, chemical, sugar, cotton yarn etc and small scale industries in electrical/electronic equipment, food products and engineering items.
. Muzaffarnagar has about 24 Paper Mills, 6 Sugar Mills and 36 Steel Rolling Mills indicating the prospects of this region. – Road Connectivity: Linkage with NH-58 (Delhi-Haridwar-Mana Pass) for which widening and strengthening is being carried out to ensure four-lane dual carriageway under Phase-3B of NHDP and other state highways. – The state government envisages development of expressway connectivity between Delhi, Meerut and Muzaffarnagar which is expected to offer enhanced connectivity to the proposed industrial area. – Rail Connectivity: Would be served by the Delhi-Meerut- Saharanpur/Lucknow Broad Gauge Rail Network. – Air Connectivity: Delhi International Airport and proposed Greater Noida Airport (at Jayur, District.Aligarh) will offer the air connectivity to the region. Meerut-Muzaffarnagar belt is proficient at manufacture of engineering units, sports goods etc. An industrial park with well-developed amenities and modern infrastructure would give a boost to the production and export of these items. Considering the large agricultural output from the Western Uttar Pradesh with respect to Mangoes, Potatoes, Basmati Rice, an integrated agro/food processing zone with backward and forward linkages is proposed for development near Hapur as value addition to the agricultural output from the state. Taking advantage of connectivity being offered by the feeder road and rail linkages for the region, a truck terminal with warehousing, truck parking/servicing facilities is proposed. – Ensuring high-speed linkage between Industrial Area and NH-58. – Linkage to/from container terminal at Dadri. – Augmentation of Delhi-Meerut-Saharanpur Link. The proposed Faridabad-Palwal Industrial Area would be located in close proximity of the western Dedicated Freight Corridor at Dadri. The nearest major urban centres include Faridabad, with a population over 1 Million, and Delhi. Faridabad is one of the major industrial towns of the state, especially with a large concentration of light engineering, electrical appliances and auto component industries.
. With over 1 Million Population, Faridabad has been identified as one of the 63 major urban agglomerations of the country to receive INR 2,679 Crore for urban infrastructure improvement under the JNNURM scheme of Government of India. These investments are proposed to be implemented by 2012. – National Highway No.2 (Delhi-Kolkata) with four/six lane divided carriageway configuration. – Delhi-Agra Main Broad Gauge Rail offers Rail Connectivity to region. – Delhi International Airport would effectively cater to the air connectivity requirements of the node. With excellent connectivity to various hinterland locations across the country and proximity to Delhi, Faridabad has good potential for investments in setting up export-oriented industrial units. With a focus on expansion of industrial activities and ensuring supporting infrastructure, augmentation of Industrial Model Township at Faridabad is envisaged. It would involve augmentation of industrial estate by about 2000 Acres along with provision of requisite infrastructure. Typical industries expected at this location include Light Engineering, Casting & Forging, Electrical Appliances, Textile and Apparel. This region would include an Integrated Logistic which constitutes an Inland Container Depot and a truck terminal with warehousing facility.
. Integrated Township: The region would be provided with an integrated township with residential, institutional, commercial and leisure/recreation infrastructure which could be dovetailed to the requirements of specific investor groups/ countries. – Linkage with NH-2, the Golden Quadrilateral NHDP Corridor. – Linkage with proposed western and eastern peripheral expressways of the NCR of Delhi. – Linkage with Delhi-Agra Main Broad Gauge Railway line and Western DFC. – Will be served by DFC terminals at Tughlakabad and Dadri. There is a potential to connect this region with DFC at Pirthala Junction. – Development of Feeder Rail links also includes construction of over bridges/ underpasses wherever required so as to avoid level crossings. Rewari-Hissar Industrial Area, located in west central Haryana, would be directly linked with the Dedicated Freight Corridor at Rewari. The nearest major urban centers include Rohtak, Bhiwani and Gurgaon, the happening IT destination in the country, and Delhi. Potential industry sectors at the region include Leather, Handloom, Bio-technology, high tensile fasteners and engineering industries.
. Would be served by the Kundli-Manesar-Palwal Expressway which envisages development of world-class infrastructure in the form of World-Trade City, Bio-Science City, Medi City, Leisure City, Cyber City, Leather City and Fashion City etc.
. Rewari-Hissar Industrial Area would be strategically located along the proposed feeder rail linkage for the Dedicated Freight Corridor between Rewari, Bhatinda and Ludhiana (Punjab). It is ideal for developing suitable logistics infrastructure.
. Delhi International Airport would cater to the air connectivity requirements of the node.
. Proposed 1200MW Coal based power plant at Hissar. With comparatively cheaper resource cost and excellent connectivity to Punjab, Rajasthan and Delhi, Rewari-Hissar has good potential for investments in setting up export-oriented industrial units. Taking advantage of connectivity being offered by the feeder road and rail linkages for the Dedicated Freight Corridor and Punjab/Rajasthan, a truck terminal with warehousing, truck parking/servicing facilities is proposed at Bhiwani. This region would be provided with an integrated township with residential, institutional, commercial and leisure/recreation infrastructure which could be dovetailed to the requirements of specific investor groups/ countries. – Linkage with proposed Western Peripheral Expressway of NCR of Delhi. – Augmentation of Rohtak-Bhiwani-Rewari, Bhiwani-Kotputli, Bhiwani-Jhunjhunu-Sikar links. – Widening and strengthening of NH-10 and NH-71 to ensure four-lane dual carriageway. NHAI envisages augmentation of NH-10 under Phase-3A. – Shall be served by the proposed feeder rail link for dedicated freight corridor between Rewari-Hissar-Bhatinda/ Ludhiana in Punjab. The Rewari-Hissar Rail link may need to be doubled. Kundli-Sonepat Investment Region, in the north-western Haryana, would be located within 50-100km distance from the alignment of Dedicated Freight Corridor at Dadri. The nearest major urban centers are Delhi and Panipat, the base of Indian Oil Corporation (IOC) Refinery in the state. Potential industry sectors at the investment region include agro-processing industry, Leather, carpet, textile/handloom and handicraft industries. The proposed investment region has the advantage of availability of good connectivity by road, rail and air besides quality urban infrastructure.
. Would be served by the Kundli-Manesar-Palwal Expressway. The Master Plan for Kundli-Manesar-Palwal Expressway envisages development of world-class infrastructure as World-Trade City, Bio-Science City, Medi City, Leisure City, Cyber City, Leather City and Fashion City etc. – Augmentation of Rohtak-Bhiwani-Rewari, Bhiwani-Kotputli, Bhiwani- Jhunjhunu-Sikar links.
. Proposed 600MW Coal based power plant in Yamuna Nagar.
. Haryana has the potential to develop a Food Grain Logistic Park to cater to the food grains produced in the northern region of the country. Accordingly, Kundli-Sonepat region has been identified as the prospective zone for developing such activities.
. Proximity to NH-1 (Delhi-Amritsar-Wagah Border). Export-oriented agricultural produce in Punjab is renowned in the country. At present, four/six laning of Delhi-Jalandhar stretch is completed where as construction work for Jalandhar-Amritsar-Wagah Border is currently under progress. North Haryana is proficient at manufacturing of leather, textile/handloom and carpets. A large industrial park would give a substantive boost to export of these items. Considering the large agricultural output from the state and to cater to the northern region of the country, a mega agro/food processing zone is proposed in the investment region. It would primarily cater to the food grains and horticulture market and would be provided with wholesale market terminals, auction areas and other infrastructure. To support the agro-processing, leather technology, carpet and textile industry as well as the other industries in the investment region, a Knowledge Hub/skill up gradation centre would be imperative. It is advisable to set it up in this area, being very close to the National Capital Region, thus having a substantial "trainable" population. To cater to the transportation, packaging and warehouse/storage requirements for the investment region, a truck terminal with servicing/repairing, truck parking, inventory management system and 3rd party logistics support is envisaged. – Widening and strengthening of Sonepat-Bahadurgarh-Jhajjar to four-lane dual carriageway. – Augmentation of NH-72A (Rohtak-Panipat) to four-lane dual carriageway. Manesar-Bawal Investment Region, in South-Western Haryana, would be located within 50km of the Rewari-Dadri alignment of Dedicated Freight Corridor. The nearest major urban centers are Delhi and Gurgaon, the IT/Automobile destination of the country. This region is proposed to be located in close proximity to the National Highway No.8, the Golden Quadrilateral Corridor between Delhi and Mumbai. Potential industry sectors at the investment region include automobiles, Electronics, Biotechnology, and IT/ITES. It is important to note that an 'Auto/ Automobile Investment Region', to be spread over 800Sqkm, is also being planned at Rewari-Manesar-Bawal to promote investment in the Automobile and Auto Component Industries.
. Proximity to the National Capital Region of Delhi.
. Established base in IT/ITES and automobile sector with several multi-national companies operating from the region. The proposed development would facilitate the expansion of existing investments.
. Proximity to the Golden Quadrilateral, NH-8 and the alignment of Dedicated Freight Corridor would provide added value to the investors in the region.
. Major emerging sectors include Bio-technology, Pharmaceutical and textile.
. Delhi International Airport will offer adequate air connectivity to the proposed investment region. This region offers wide potential for expansion of existing industrial activities as well as cater to the emerging industry sectors. A large industrial park would give a substantive boost to the state.
. IT/ITES/Biotech Hub: The proposed investment region will offer opportunity for IT/ITES companies desirous of setting up/expanding their operations. This region is also expected to serve the Biotechnology industry.
. Knowledge Hub/Skill Development Centre: To support the automobile, IT/ITES and Engineering sectors, a Knowledge Hub/skill upgradation center would be imperative.
. Integrated Logistics Hub with ICD: This will include an Inland Container Depot at Bawal and a freight logistics park to facilitate auto exports from the region along with truck terminal facilities.
. Integrated Township: This region would be provided with an integrated township with residential, institutional, commercial and leisure/recreation infrastructure which could be dovetailed to requirements of specific investor groups/ countries. – Augmentation of NH-71 (Rewari-Rohtak-Jalandhar) link to four-lane dual carriageway. Khushkhera-Bhiwadi-Neemrana Investment Region, in North-Eastern Rajasthan, would be located within 50km from the alignment of Dedicated Freight Corridor. This region also falls under the National Capital Region of Delhi and is located close to the National Highway No.8 which forms part of the Golden Quadrilateral. Government of Rajasthan has set out ambitious plans for the region by developing a Global City, to be spread over 40,000 Acres, between Shahjahanpur, Neemrana and Behror and expected to cater to 1 Million Population. Detailed master planning is being carried out for the project.
. Khushkhera-Bhiwadi-Neemrana Investment Region is located at a distance of 107km from Delhi.
. Widening of Alwar-Dausa Link (81km) is being carried out by RIDCOR through private sector participation.
. Availability of huge Land parcels of land at comparatively lower prices.
. Potential industry sectors at the investment region include automobile, Biotechnology, IT/ITES and Health Sector.
. Proximity to the Golden Quadrilateral, NH-8 and the Dedicated Freight Corridor would provide added value to the investors in the region.
. Delhi International Airport will offer good connectivity to the proposed investment region. Besides, an independent airport complex is also proposed to be developed.
. State Government has already identified and designated the land for developing the region as Global City.
. Export-oriented Industrial Units/ SEZ: This region has the potential for developing Auto component etc.
. Knowledge Hub/Skill Development Centre: To support the auto component, IT/ITES and Biotechnology sectors, a Knowledge Hub/skill up gradation centre would be imperative at Nimarana.
. Integrated Logistics Hub: This will include an integrated development for efficient logistics system with container handling/storage facilities, truck parking and warehousing.
. International Airport Complex: This investment region is proposed to be provided with an Airport Complex having an air strip and other integrated facilities that would cater to the needs of business visitors like baggage check-in, registration with the Ministry of External Affairs for overseas visitors etc. Jaipur-Dausa Industrial Area would be located within 50km-100km from Phulera, an important junction on DFC. Government of Rajasthan is considering development of a Growth Pole at Sikandra and initiated the study for preparation of detailed project report. Growth Pole will cater to multi-sectoral clusters as stone, carpet, leather and dairy and will cover an area of 1250sqkm and 350 villages.
. Broad gauge Rail linkage between Jaipur and Agra.
. Availability of Large parcels of land at comparatively lower prices as this region is currently under developed despite immense potential.
. Proposed Industrial Area will cater to the export-import requirements at Sikandara Growth Pole.
. Jaipur Airport will offer the air connectivity to the proposed industrial area.
. Export-oriented Industrial Units/ SEZ: This industrial area has the potential to cater to leather, marble and carpet making industries. An export-oriented industrial park would give a substantive boost to the sector in the region.
. Truck Terminal with Warehousing Facilities: In order to cater to the truck parking/servicing facilities along with warehousing, communication and other logistic infrastructure would be developed.
. Agro/ Food Processing Zone: Agriculture predominates all over the state with about 70% population engaged in agriculture activities. Rajasthan offers opportunities for contract farming, processing of oil seeds, fruits and vegetables, and dairy production. Accordingly, an agro/food processing zone with necessary backward and forward linkages is envisaged in the industrial area.
. Jaipur Airport Development: In order to cater to the requirements of international connectivity, Government of India has proposed augmentation of infrastructure at Jaipur Airport. Accordingly, development of Jaipur Airport is proposed to be carried out under DMIC project. – Jaipur-Dausa Industrial Area will be served by Jaipur-Bharatpur-Agra Broad-gauge Railway Line and linked to DFC at Phulera. Ajmer-Kishangarh Investment Region would be located close by the alignment of Dedicated Freight Corridor at Ajmer. Main minerals of the area are feldspar, quartz, asbestos, soapstone, manganese, calcite, limestone, mica, emerald, marble, granite, and masonry stone. This investment region will be served by two National Highways viz. NH-8 for Delhi-Mumbai and NH-79 for Ajmer-Chittaurgarh-Indore. Four/Six laning of NH-8 is completed.
. Located along NH-8, Golden Quadrilateral Corridor offering connectivity to rest of India.
. Ajmer and Kishangarh are renowned for marble and textile industries.
. Proximity to the Dedicated Freight Corridor.
. Ajmer-Pushkar has been identified under the JNNURM mission and is expected to receive INR 746 Crore for urban infrastructure improvement over a seven year time period.
. Jaipur Airport will offer air connectivity to the proposed investment region.
. Export-oriented Industrial Units/ SEZ: This industrial area has the potential to cater to marble, mineral processing and textile industries.
. Augmenting Existing Industries: It is envisaged that a Textile Park in the vicinity of Kishangarh would be considered for upgradation. As per estimates prepared by the state government, it would require an investment of INR 210 Crore and is expected to generate an employment of 4000.
. Integrated Logistics Hub: This will include a Logistic Park with warehousing and truck terminal facilities. – Shall be served by the Dedicated Freight Corridor at Phulera Junction. Rajsamand-Bhilwara Industrial Area is located between NH-8, NH-79 and in close proximity to Dedicated Freight Corridor at Marwar. Bhilwara, also known as \'Textile City of India is the leading manufacturer, exporter and supplier of world-class Suiting (BSL, Mayur & Suzuki Suiting), Flock Fabrics and Yarn. Located in the western part of Rajasthan, Bhilwara is also famous for its Mineral and Stone Industry. Rajsamand is renowned for its marble and has several prominent large and medium scale industries including Marble, Tyre and Zinc. Cottage & Artisan units based on handloom, leather, terracotta & livestock are other major attractions. The items having export potential are terracotta, silver miniature, and decorative marble articles etc.
. Rajsamand-Bhilwara Region is served by NH-79, NH-76 and NH-8, which are part of the Golden Quadrilateral Corridors. Widening and strengthening of these highways to four lanes is already completed whereas six laning would be completed by 2015.
. Well established industrial base in textile, marble and Zinc Industries.
. The nearest airport is located at Udaipur.
. Export-oriented Industrial Units/ SEZ: This industrial area has the potential to cater to marble and textile industries, silver miniature, marble decorative and terracotta.
. Truck Terminal with Warehousing: In order to cater to the freight consolidation, truck parking/servicing facilities along with warehousing, communication and other logistic infrastructure would be developed.
. Udaipur Airport Development: In order to boost tourism and ensure a value outlet for high value export goods, DMIC will support establishment of a modern airport at Udaipur with connectivity to major metropolitan areas of India.
. Knowledge Hub/Skill Development Centre: To support the textile, chemical and marble industry, Biotechnology and Agro/Food Processing sectors, a Knowledge Hub/skill up gradation center would be developed as part of the industrial area. – Shall be served by the Ajmer-Chittaurgarh Railway Link. Pali-Marwar Industrial Area will be located within 50km from the Dedicated Freight Corridor at Marwar. Pali is renowned for its textile industry and Marble cutting/ finishing, leather, agriculture instruments, chemicals, cement and mineral based units. This industrial area is served by NH-14, NH-8, NH-76, and NH-65. While the widening of NH-8 and NH-76 to four lanes has been completed, widening and strengthening of NH-14 and NH-65 to four lanes is being implemented under Phase-2 and Phase-3A respectively.
. Pali has a range of industries viz. Textile, marble cutting, leather, agricultural instruments, chemicals, cement and minerals based industrial units.
. Pali-Marwar Industrial Area is well served by the road network (junction of NH-14, NH-65 at Pali) and rail network (Marwar Junction) that offer connectivity to rest of India.
. Proposed DFC alignment passes through Marwar Junction and offers excellent connectivity.
. Jodhpur Airport, located at 70km from Pali, serves the air connectivity to the region whereas an Air strip located at Sojat, 30km from Pali serves the VIP movements to the region. – Guar is an important crop for its fodder as well for its gum, extracted from its seed which has got an industrial importance. The gum is utilized in textiles, confectioneries, explosives, oil explorations, and other gum industries. The gum is exported and is a good foreign exchange earner for the state. – Produces sesamum (for edible oil, highly useful in the manufacturing of perfumed oils and pharmaceutical preparation) and mustard (oil & solvent extraction) oil seeds. – Barley (Alcohol and Processed Food) at Udaipur.
. Export-oriented Industrial Units/ SEZ: This industrial area has the potential to cater to marble and textile and dairy/food processing industries.
. Augmenting Existing Industries: It is envisaged that a Textile Park would be developed in the vicinity of Pali. As per the estimates prepared by the state government, it would require an investment of INR 420 Crore which is expected to generate an employment of 20,000. Industrial Estate up gradation plan would involve augmentation of physical and social infrastructure besides expansion of industrial area. This project is proposed to be implemented on Public Private Partnership format.
. Agro/Food Processing Hub: Pali offers excellent opportunities for setting up agro processing hub with necessary backward and forward linkages, with its rich agriculture base which includes production of Guar gum, sesamum, wheat, cotton seed oil. Accordingly, an agro/food processing zone is envisaged in the industrial area.
. Integrated Logistics Hub: This will include an Inland Container Depot at Marwar Junction with a truck terminal facility within the industrial area. – Shall be served by the Dedicated Freight Corridor at Marwar.